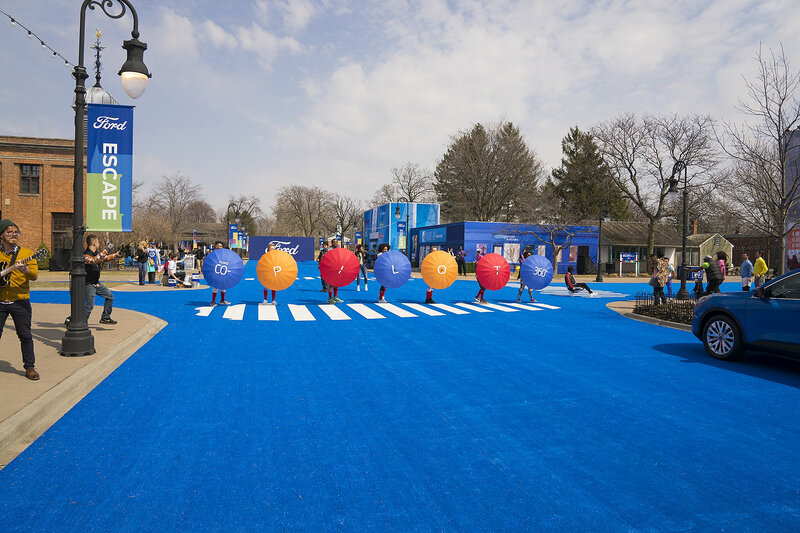 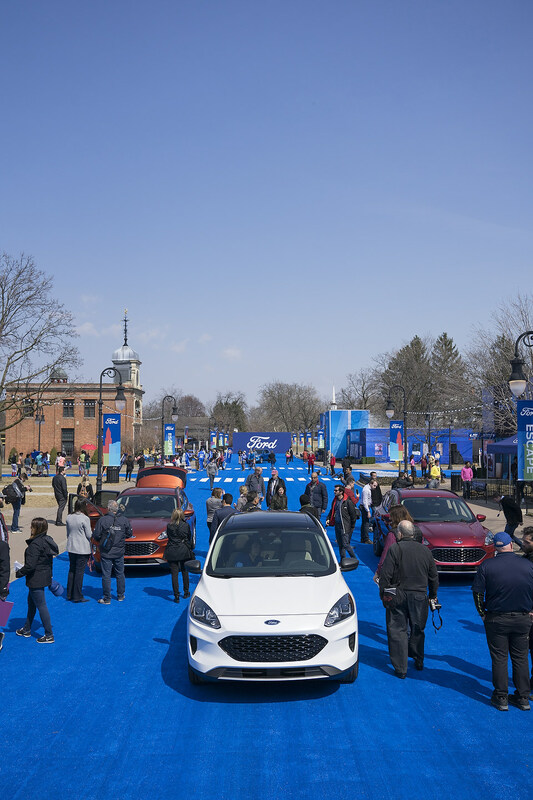 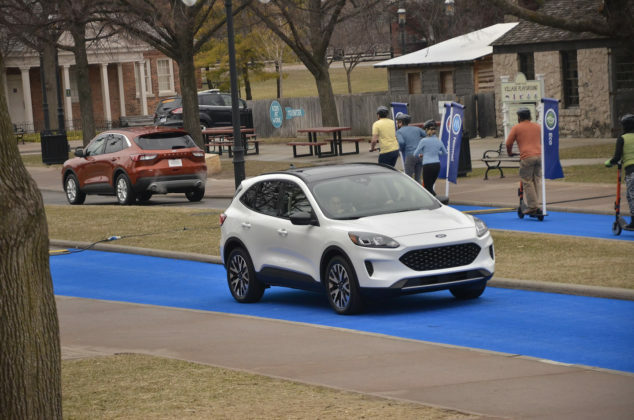 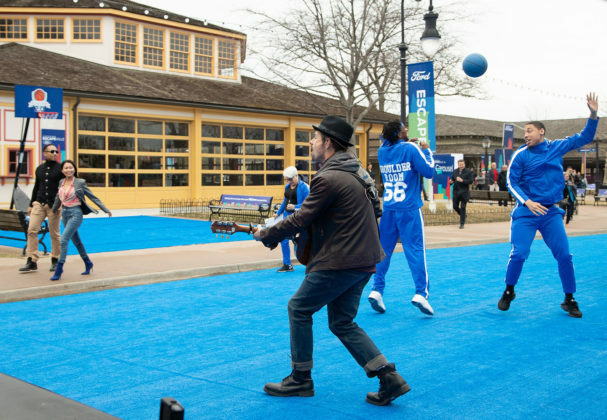 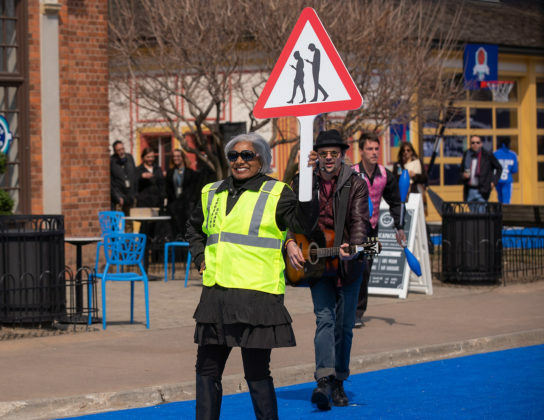 Ford is preparing for its car-less future. 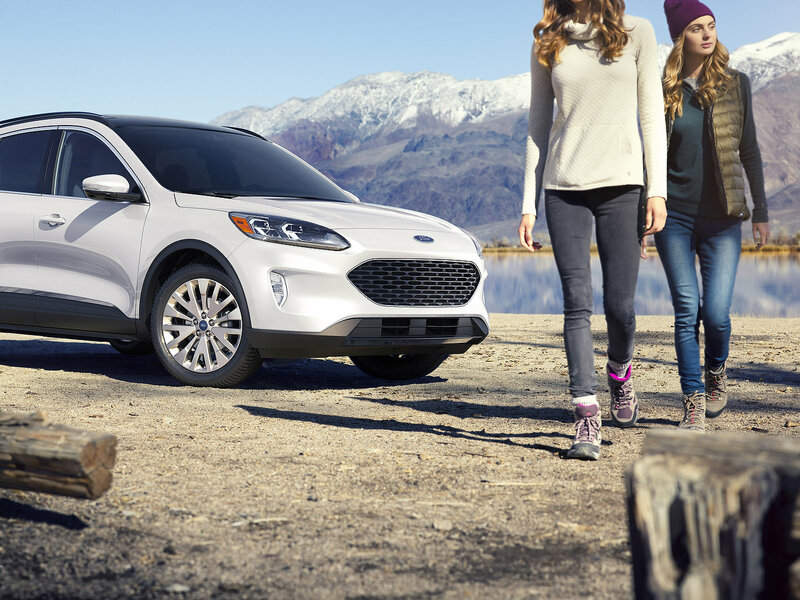 Key to its success will be the compact Ford Escape. 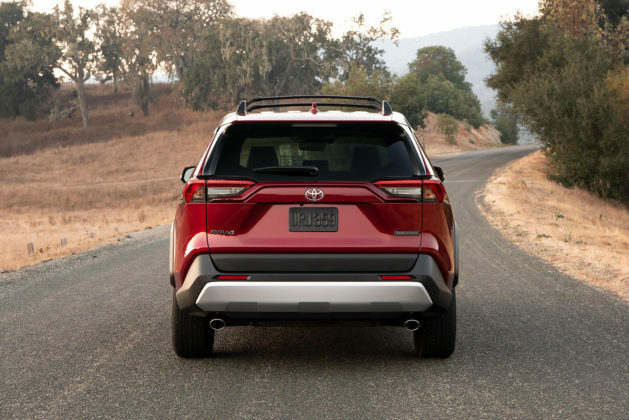 Let’s see how it measures up to the all-new Toyota RAV4. 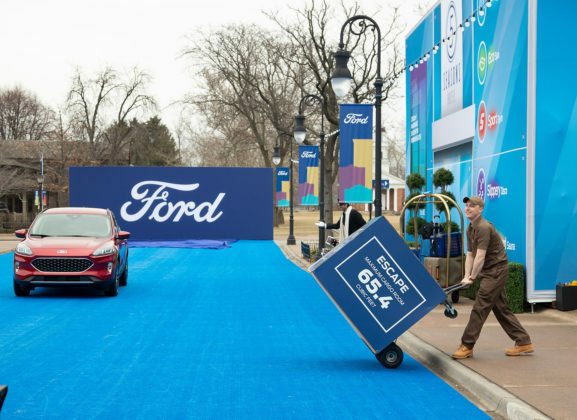 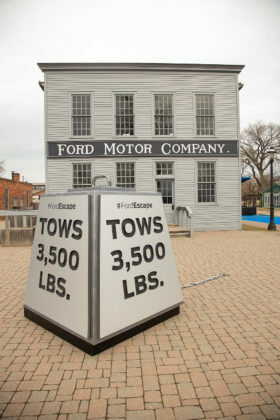 The stakes are very high, at least for Ford. Last year, nearly 44,000 Ford Escape found new homes, a 10% drop over 2017. 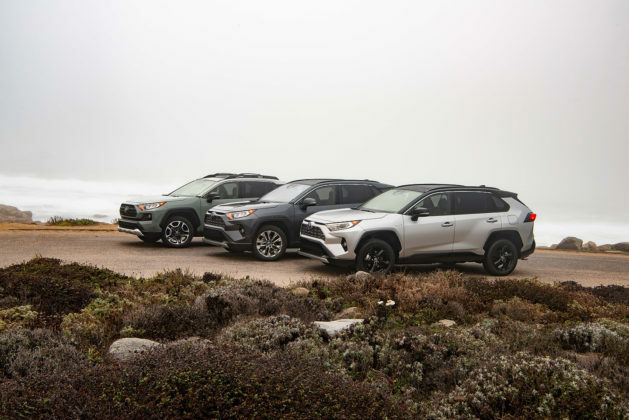 In the same periods, over 55,000 Toyota RAV4 were delivered, a 10% increase over 2017. 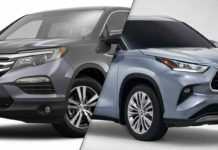 At the time, both vehicles were in their previous generations. 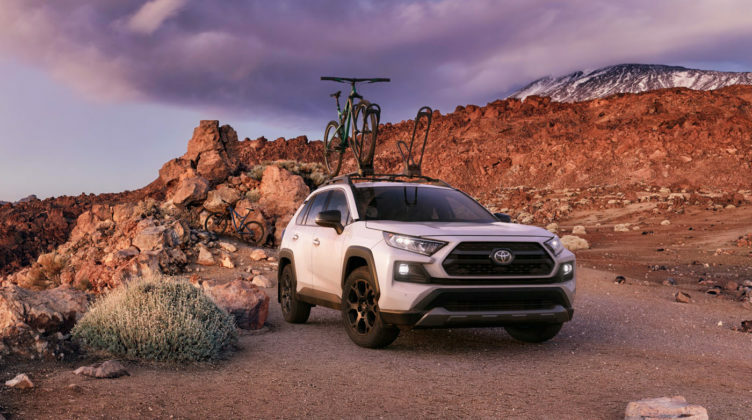 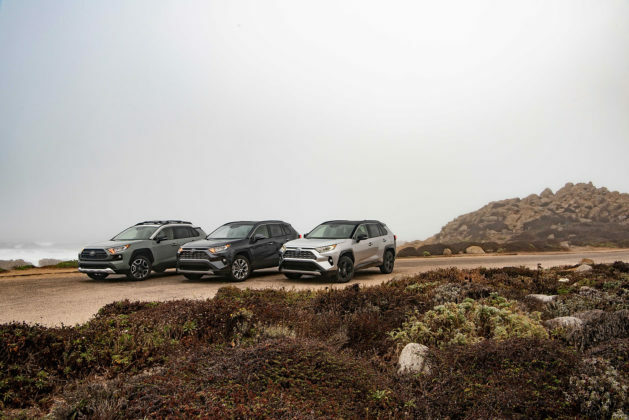 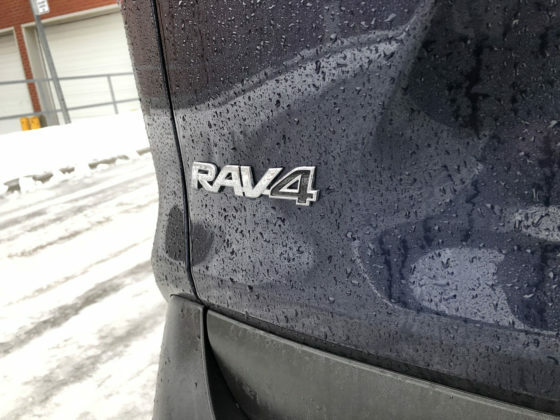 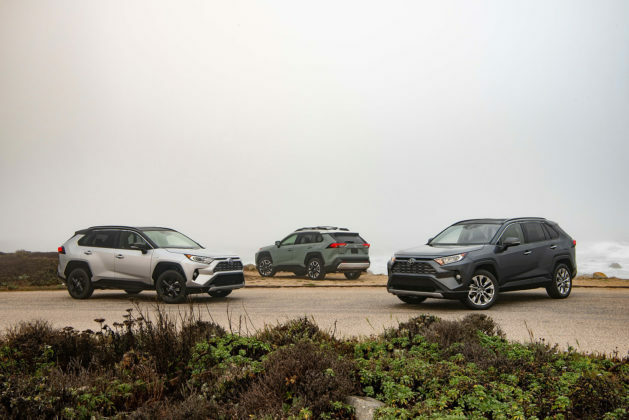 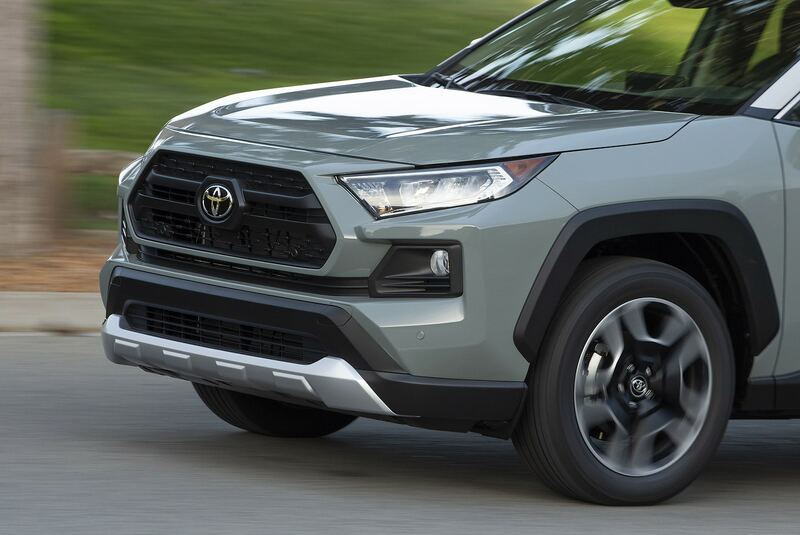 2019 should be a very strong year for the RAV4. 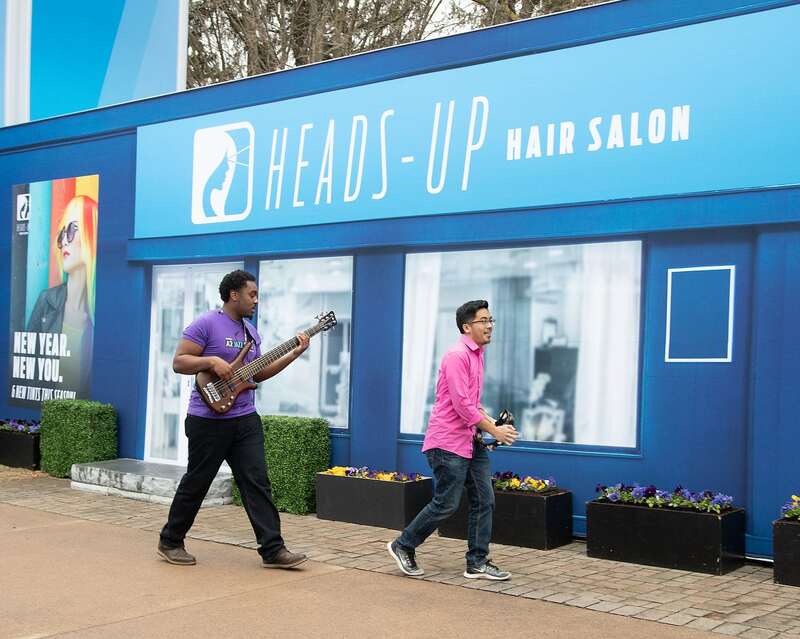 With 2018’s momentum behind it, we expect it will do well, and with reason. 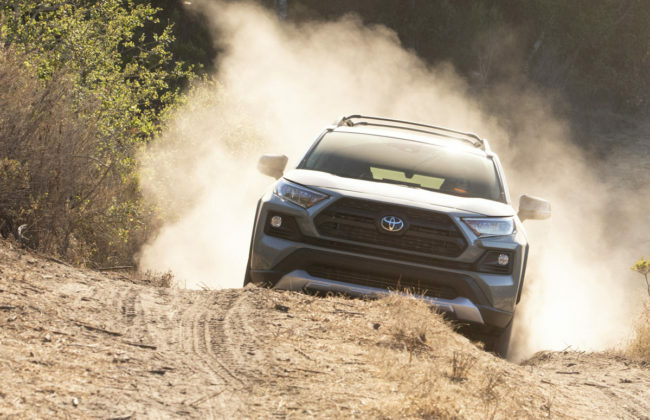 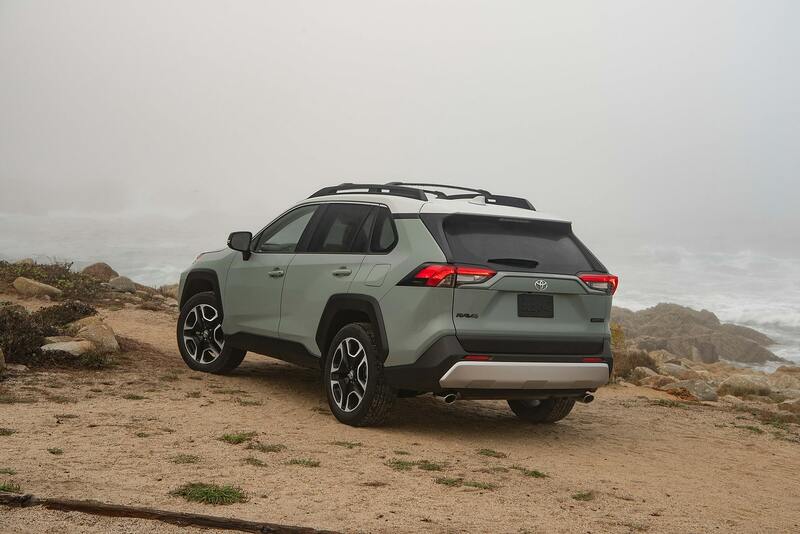 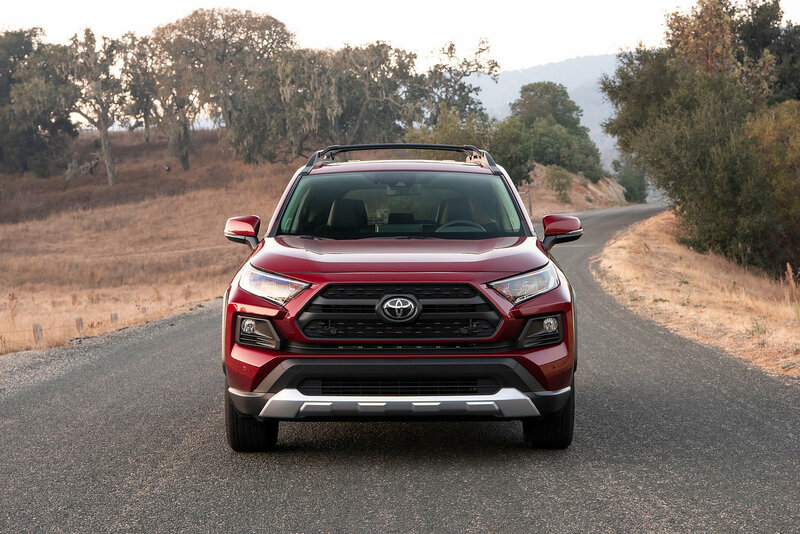 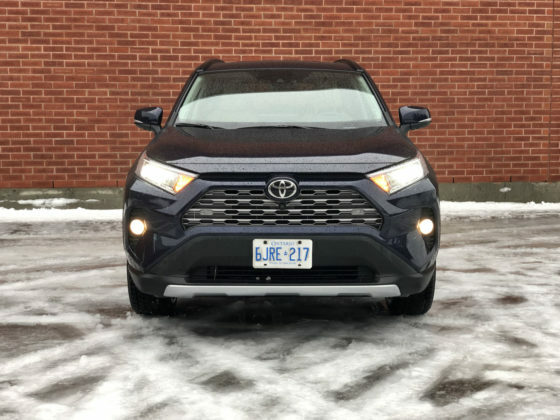 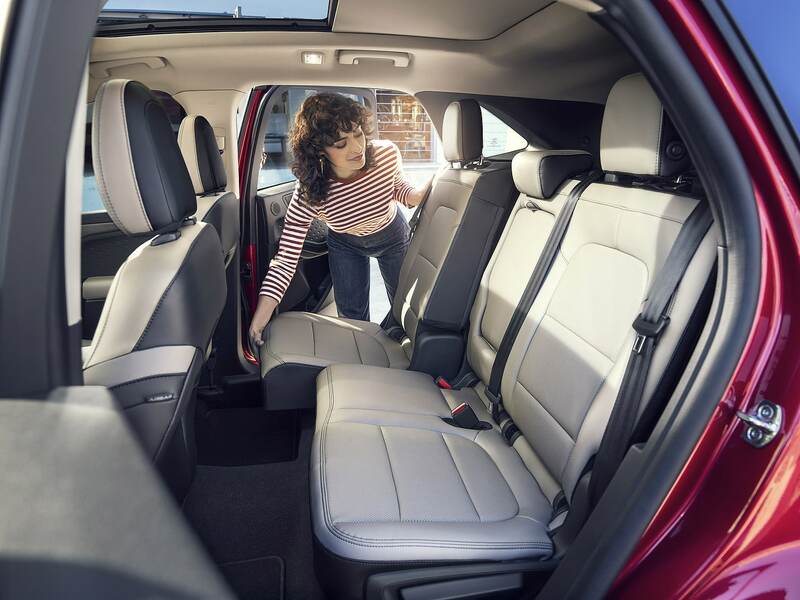 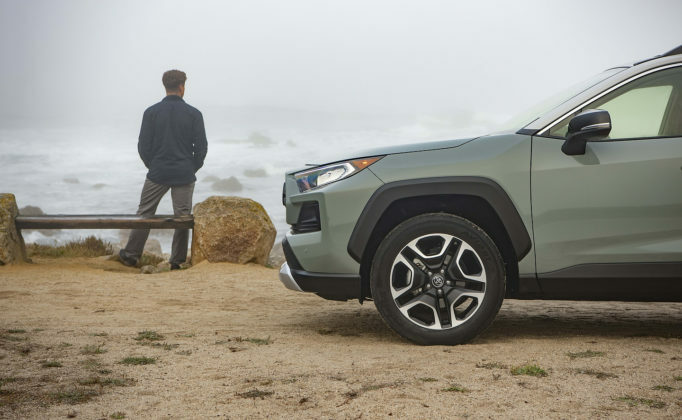 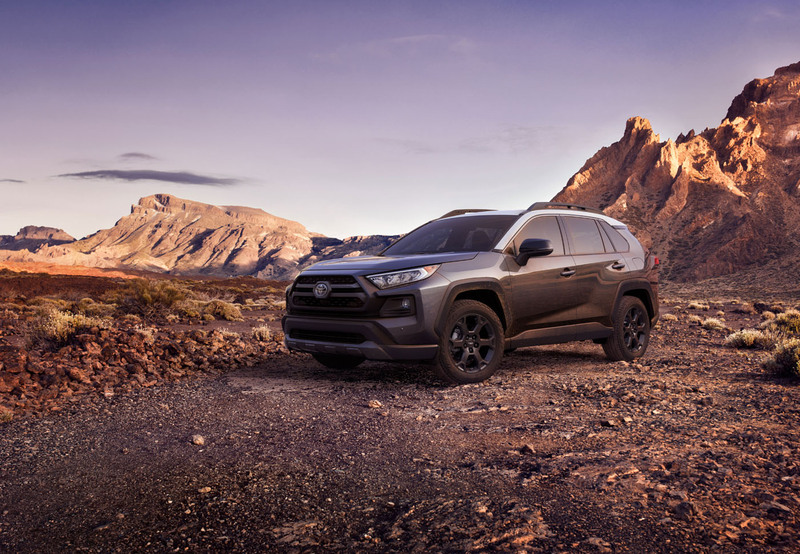 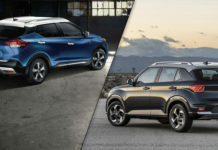 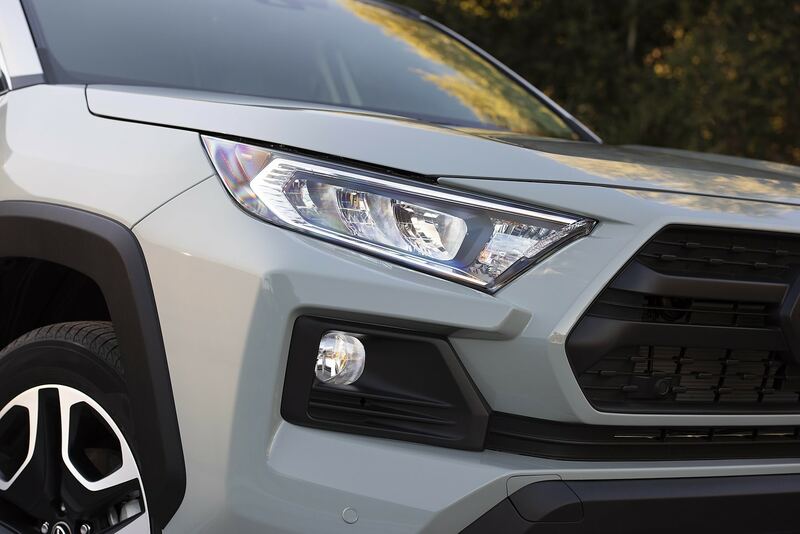 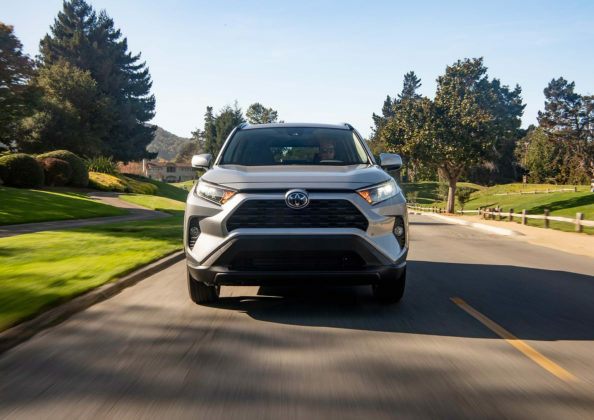 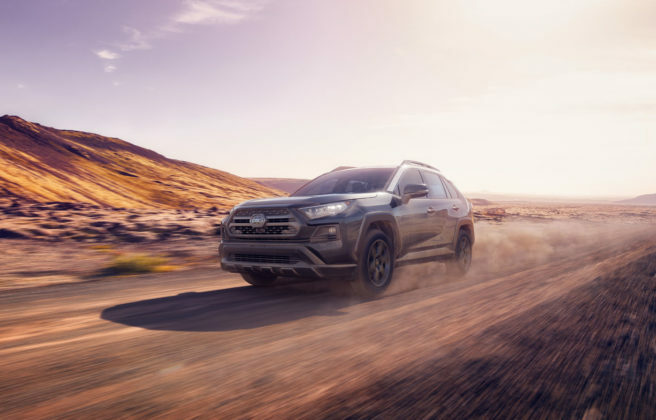 The new Toyota RAV4 responds to all needs and wants but now, Ford needs and wants consumers to take notice of their new Ford Escape. 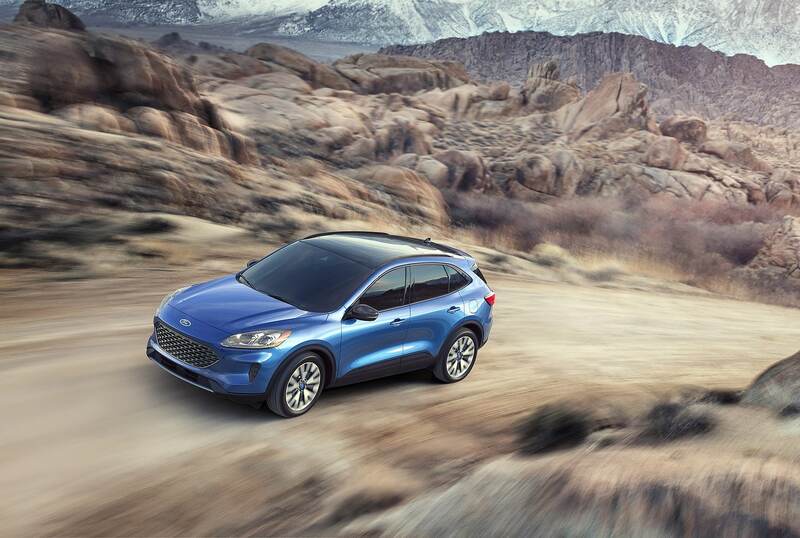 The 2020 Ford Escape only arrives next fall and like the RAV4 will be offered in a hybrid version. 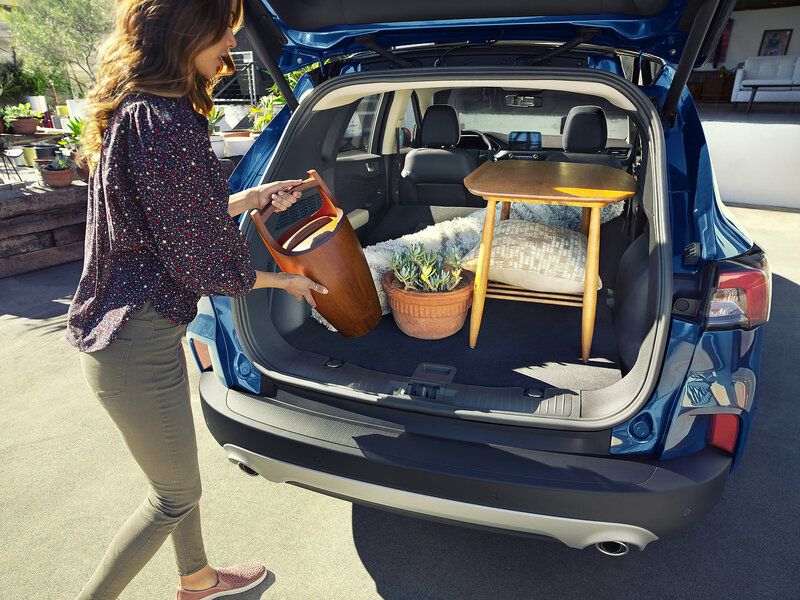 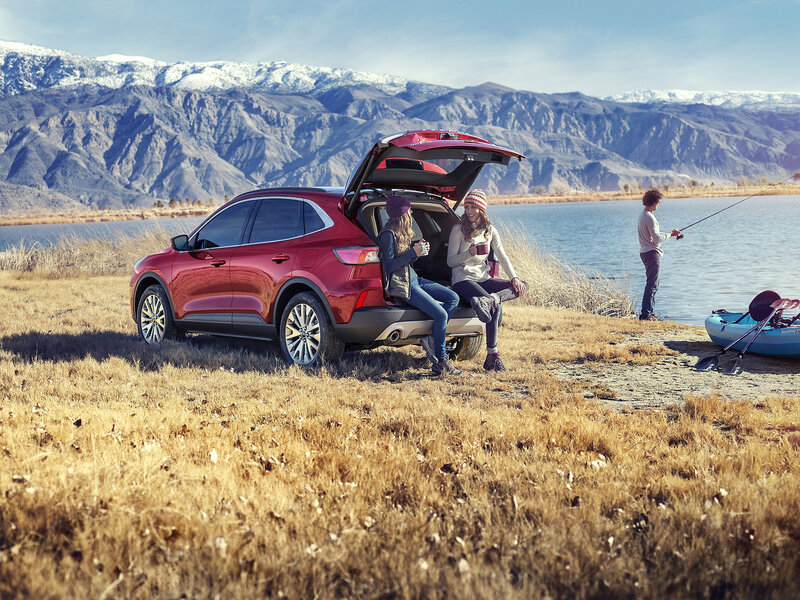 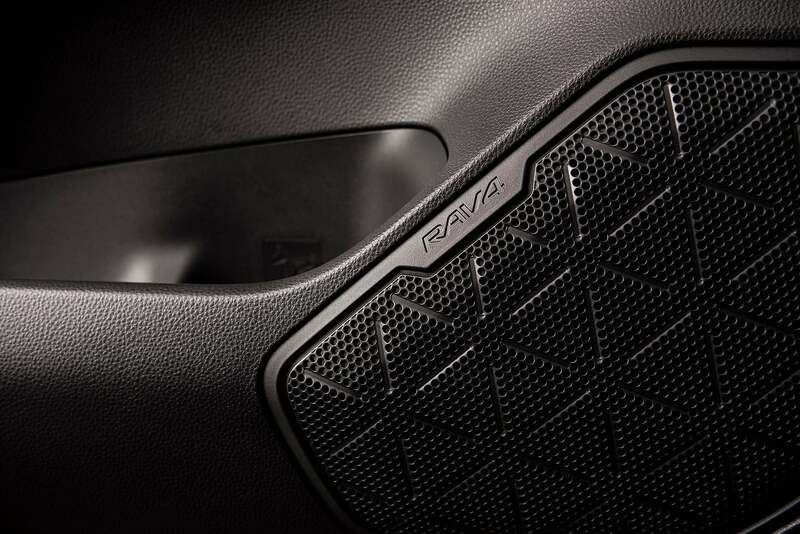 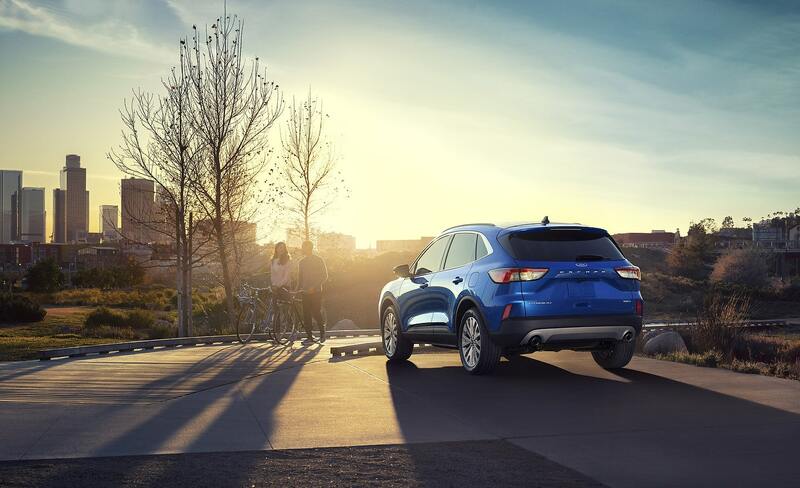 The question is whether or not you should wait another six months for the Escape or drive away in a RAV4 today. 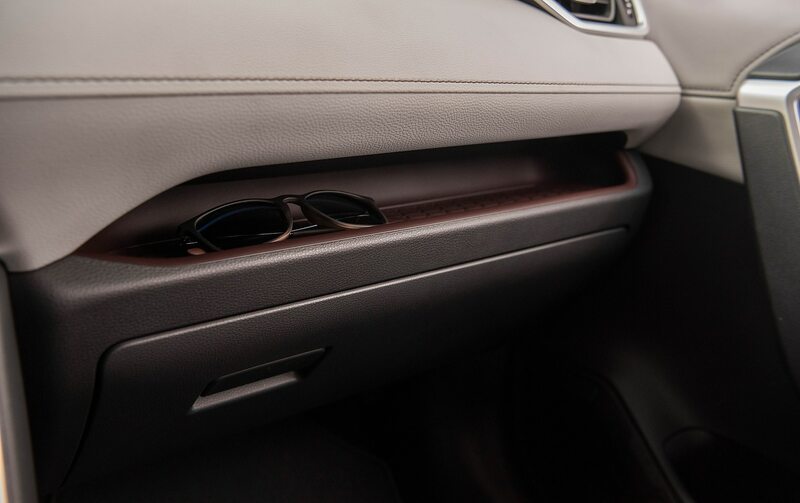 Let’s take a closer look at the specs to see if we can’t shine some light on the situation. 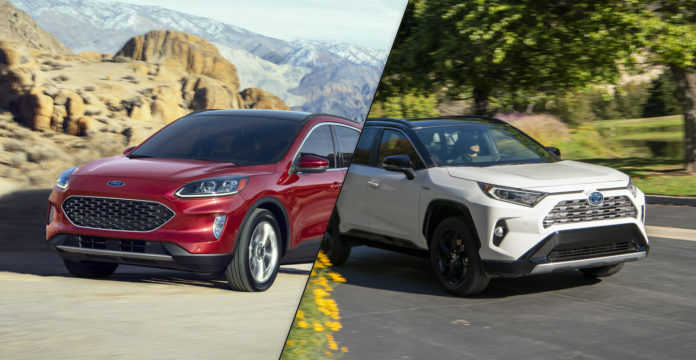 Toyota and Ford are taking different roads to get you on the road, at least for the non-hybrid versions. Ford’s invested heavily in turbocharging hence why the 1.5-litre and 2.0-litre EcoBoost engines with Auto Start-Stop Technology will be available. The 1.5 will deliver 180-horsepower and 177 lb.-ft. of torque while the 2.0 will produce 250-horsepower and 275 lb.-ft. of torque using 93 octane fuel in both cases. 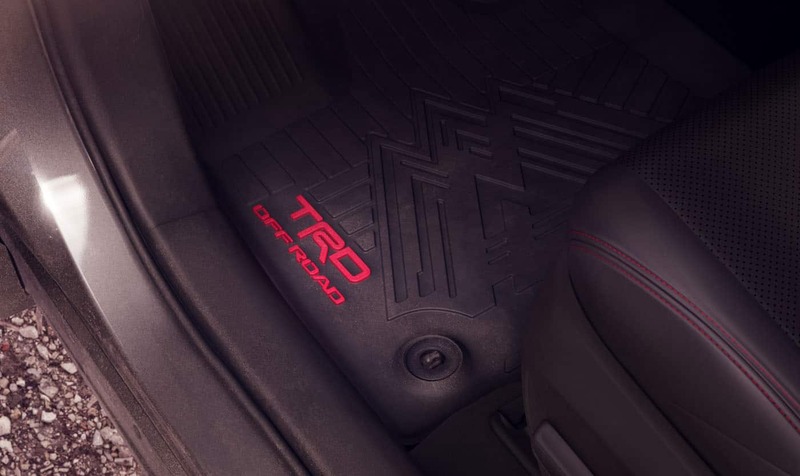 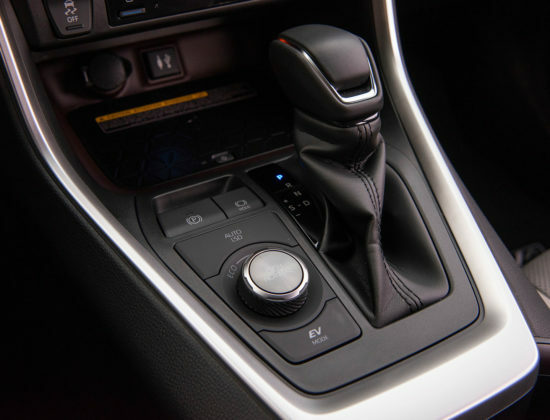 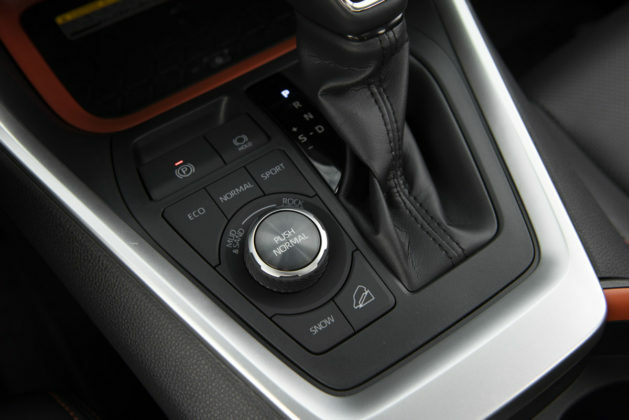 Mated to these mills will be a new 8-speed automatic transmission which will have a positive impact on both acceleration and overall fuel efficiency. 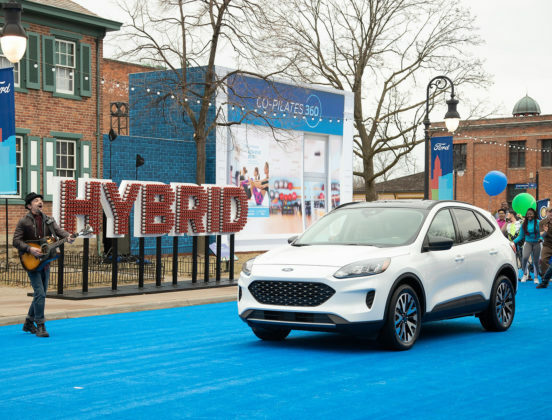 The hybrid will gain an all-new 2.5-liter Atkinson cycle hybrid engine and electronic continuously variable transmission. 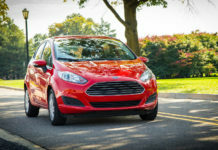 Total system horsepower will be of 198 for both FWD and AWD iterations. The FWD-only plug-in version will deliver 209-horsepower and an EPA-estimated range of at least 50 km in EV mode. 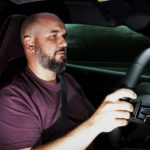 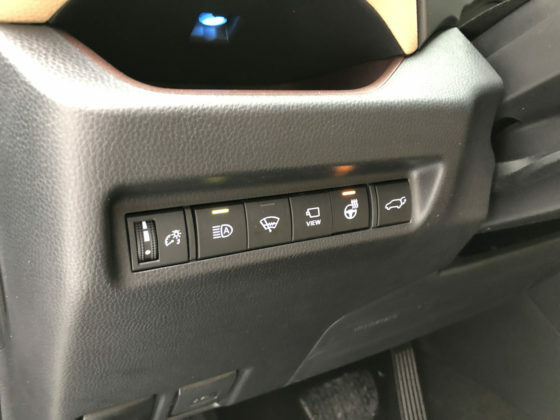 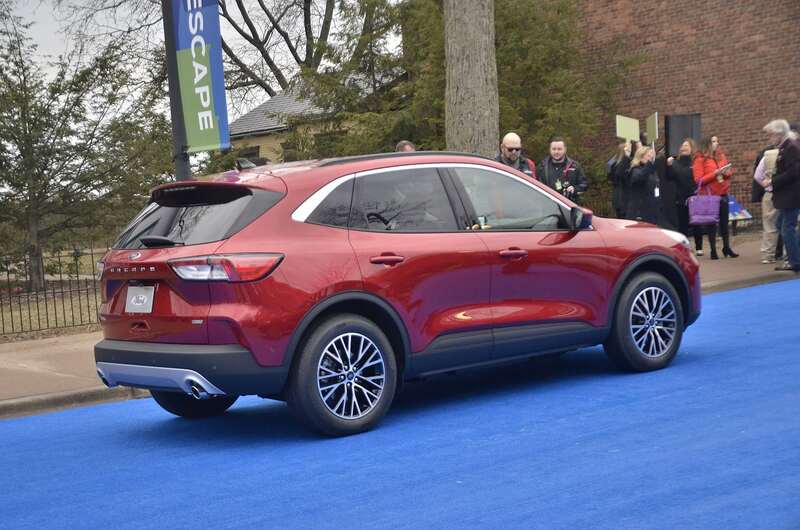 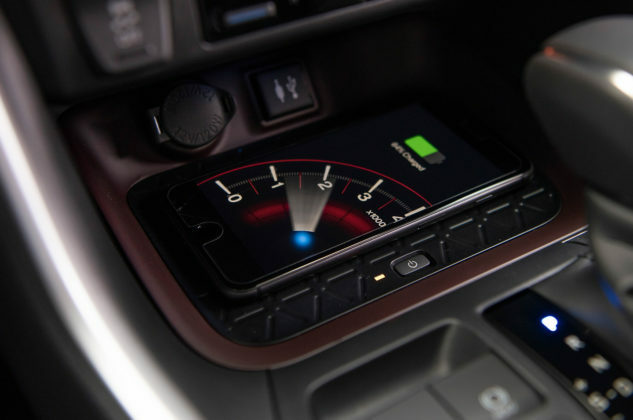 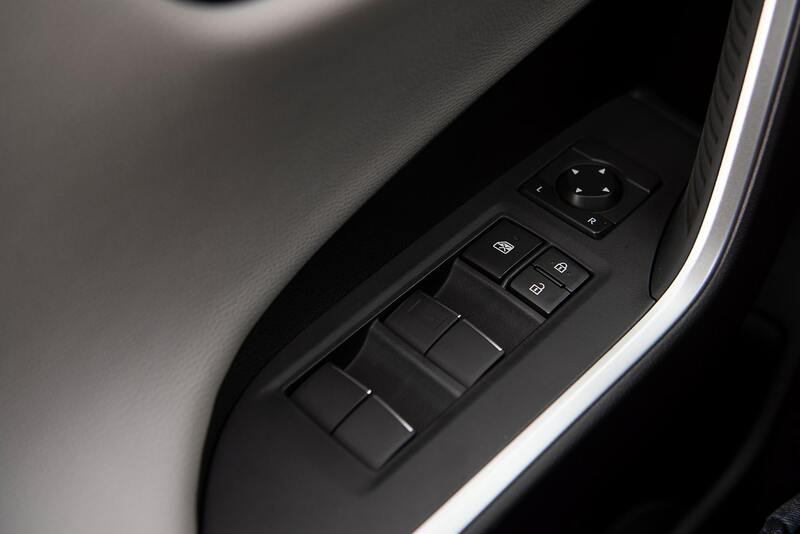 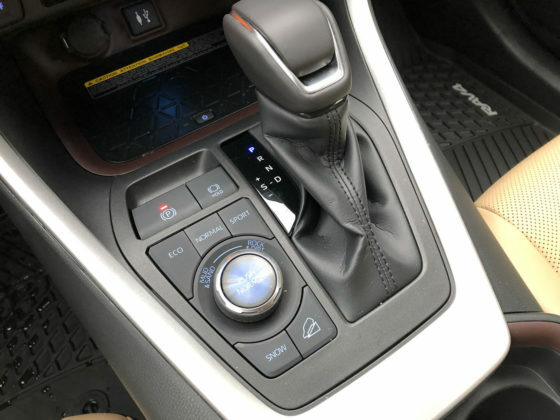 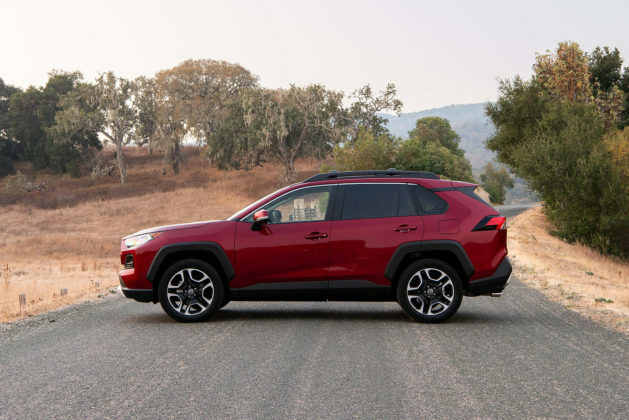 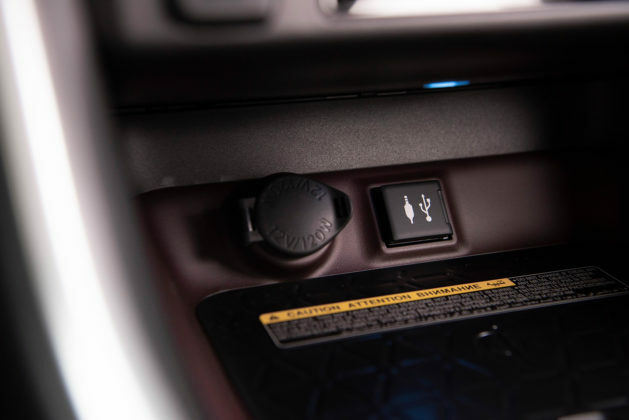 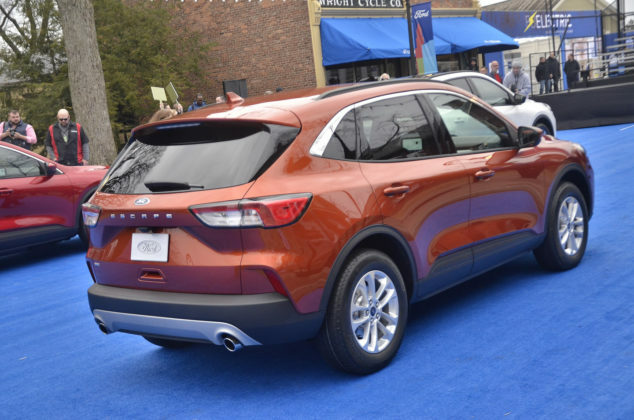 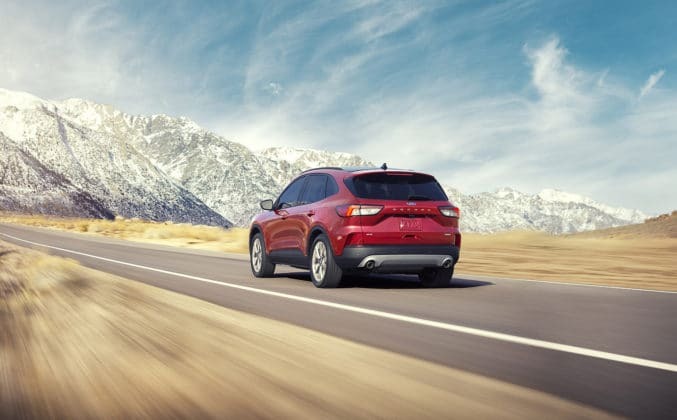 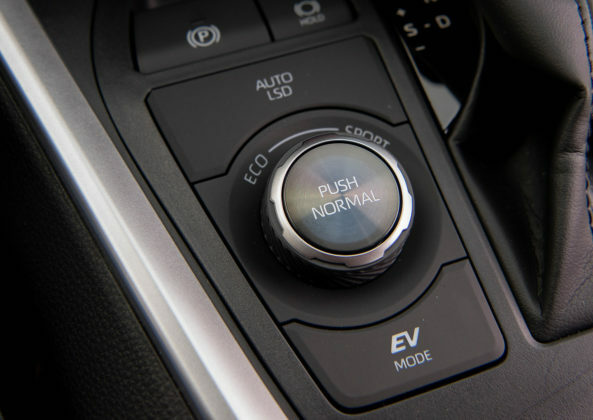 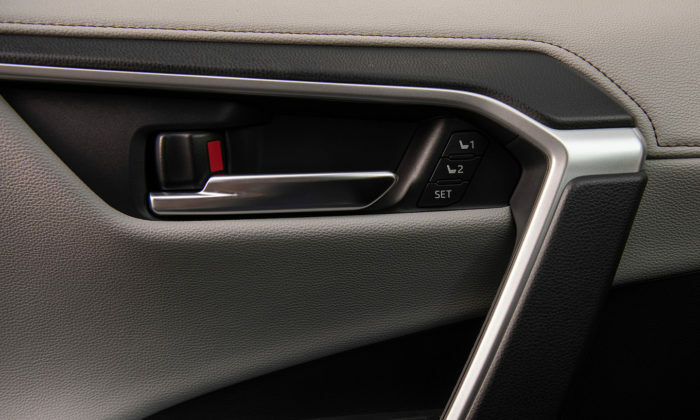 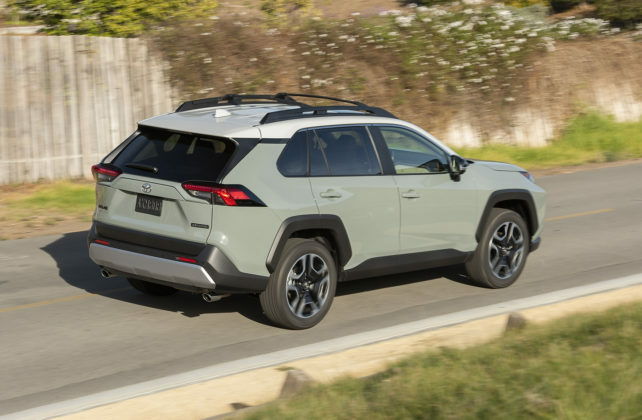 The AWD system in gasoline Escapes will feature a rear-driveline disconnect mode when the system detects AWD is not needed – this is not an unusual function. 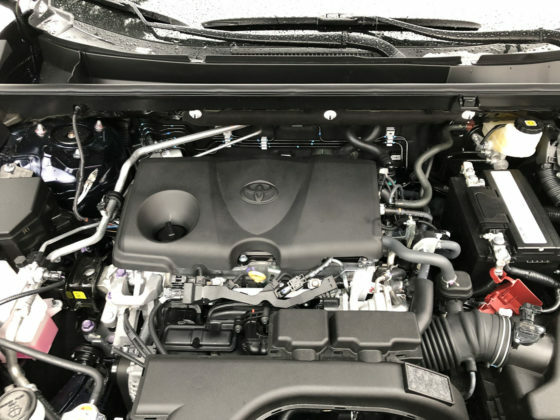 Toyota’s RAV4 depends on a normally-aspirated 2.5-litre 4-cylinder engine good for 203-horsepower and 184 lb.-ft. of torque also coupled to an 8-speed automatic transmission. The RAV4 hybrid to features a 2.5-liter Atkinson cycle engine and continuously variable transmission. 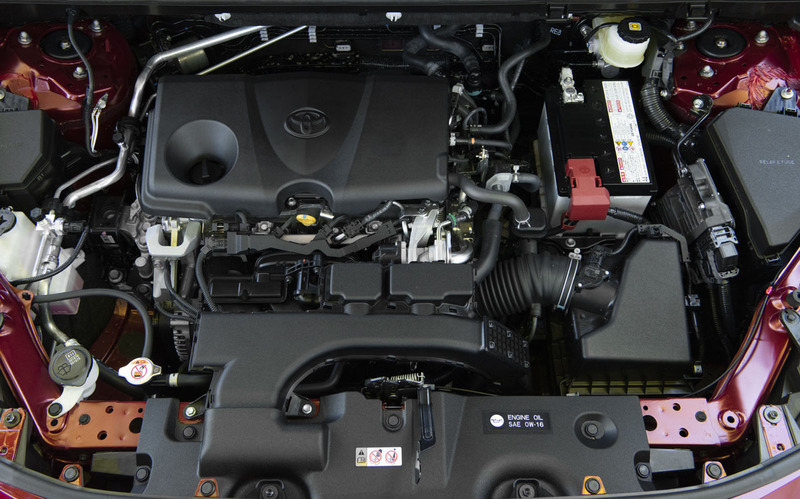 In its case, the powertrain generates 219-horsepower. 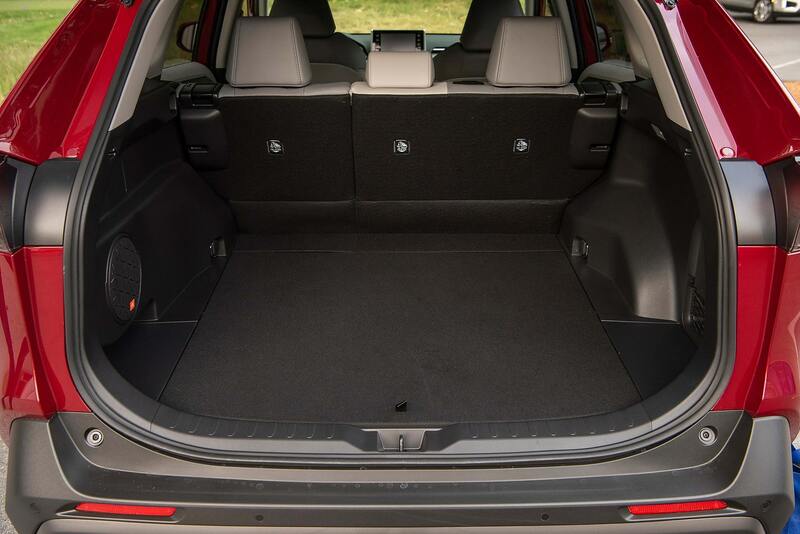 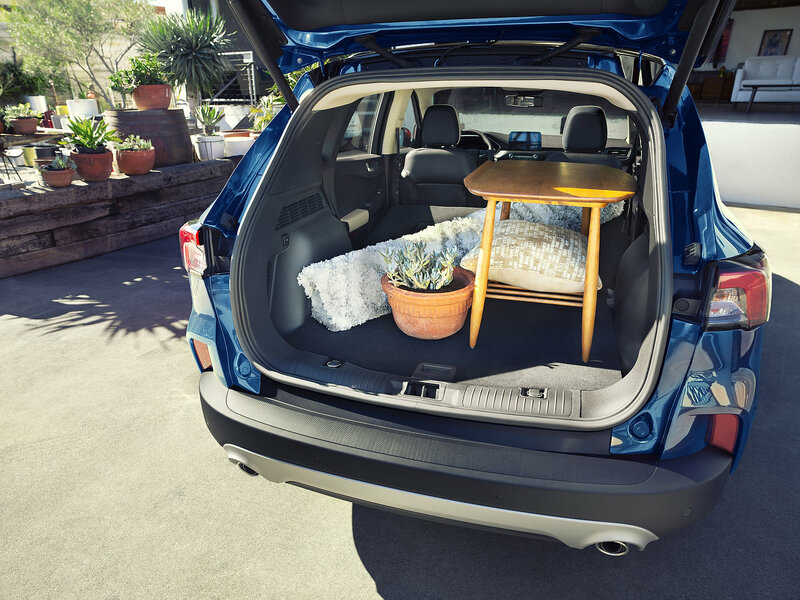 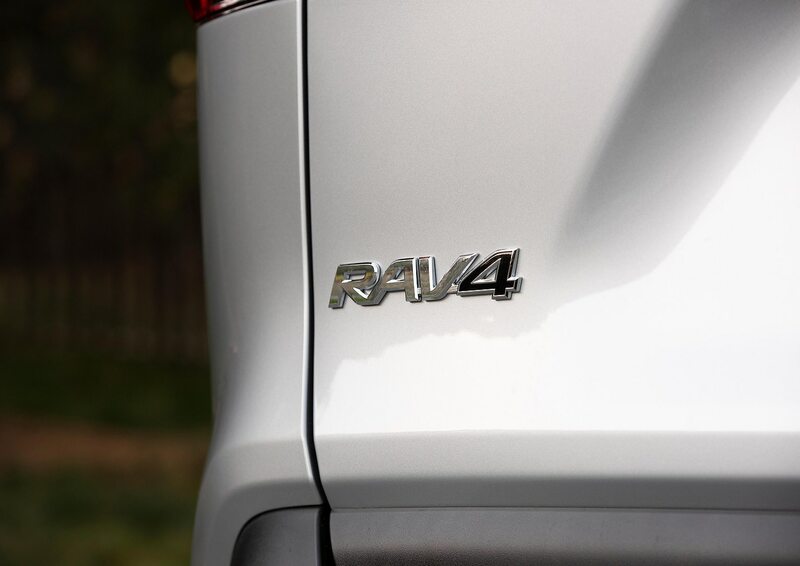 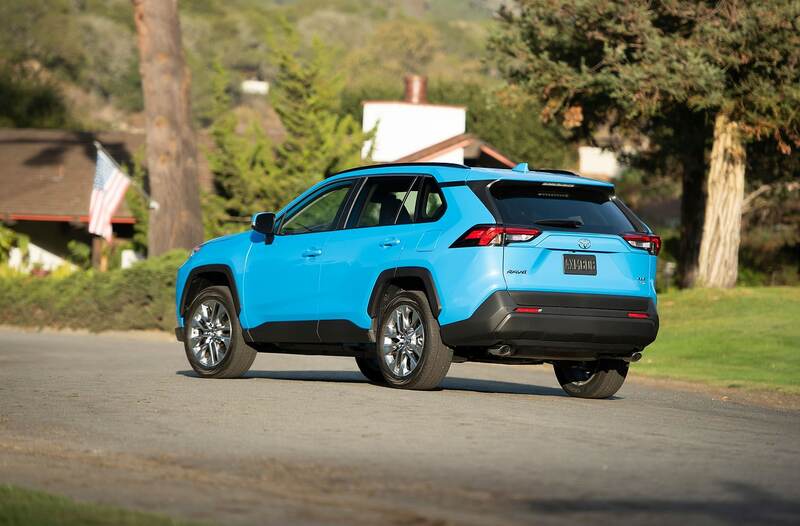 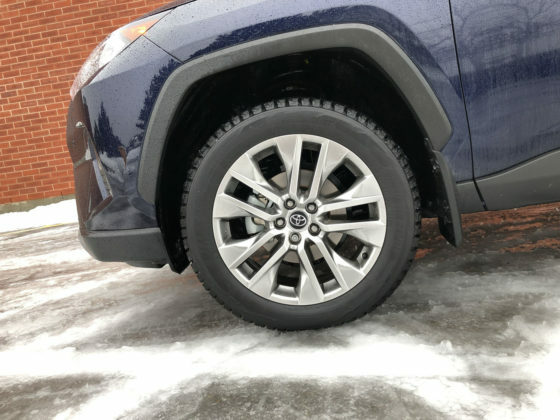 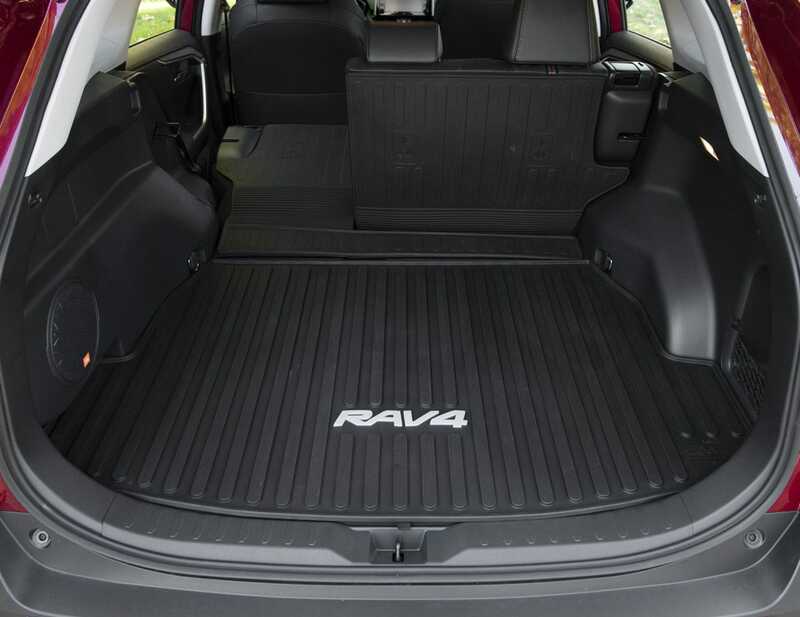 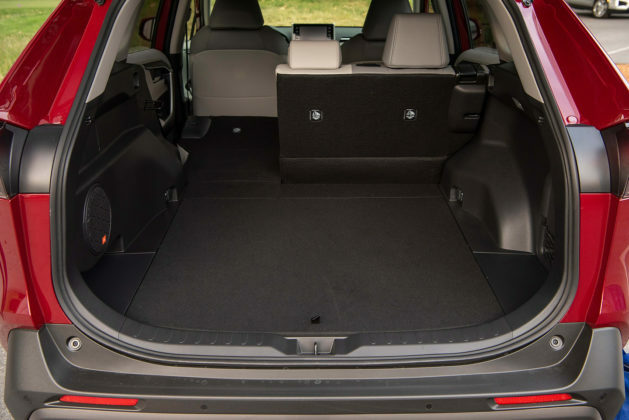 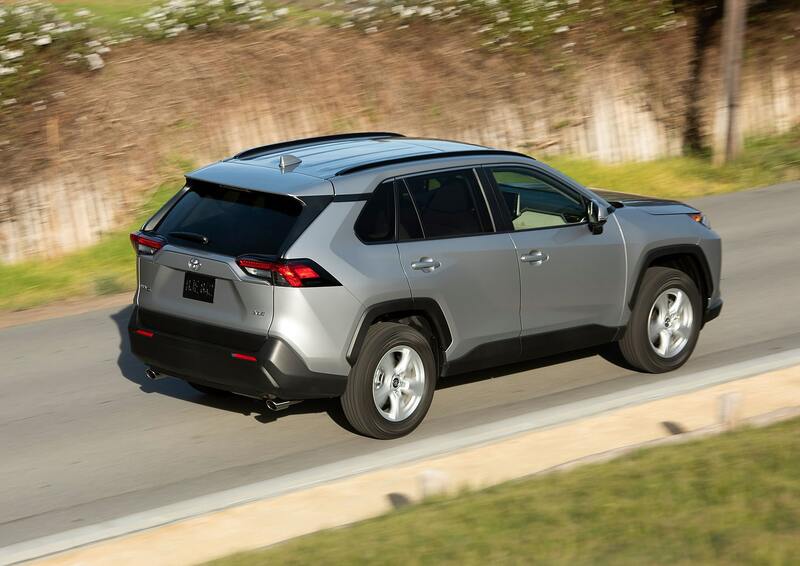 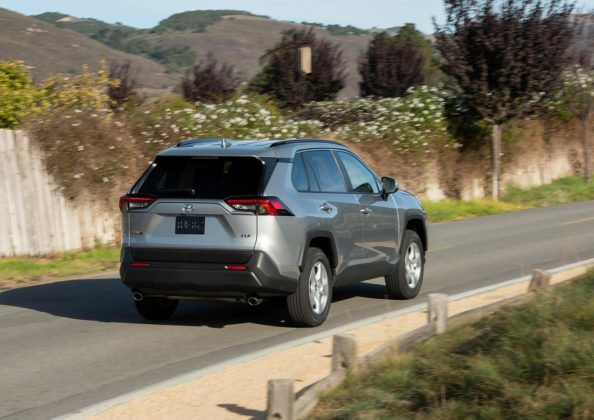 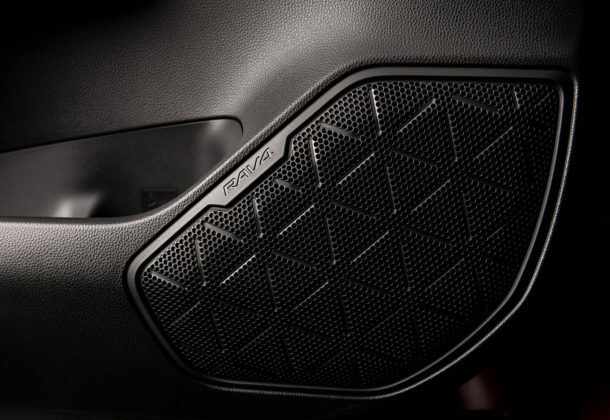 Like the Ford Escape, the RAV4 is front-wheel biased with rear-wheel kicking in when required. 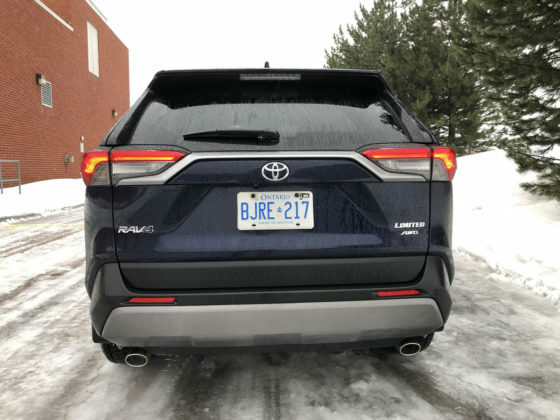 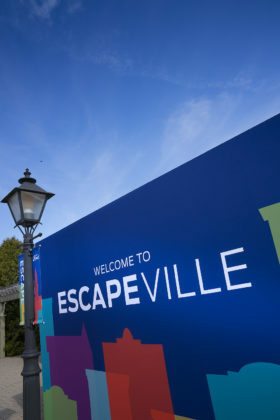 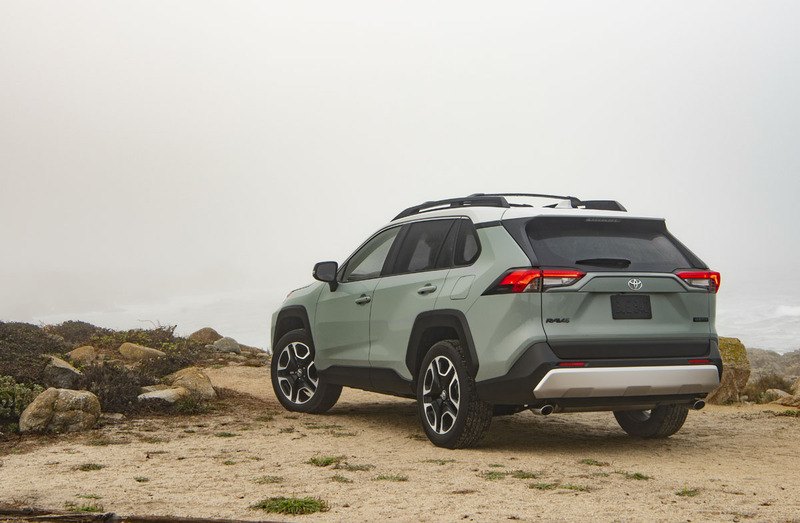 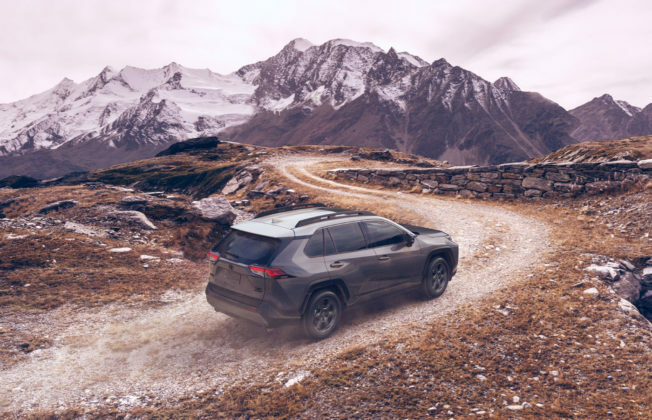 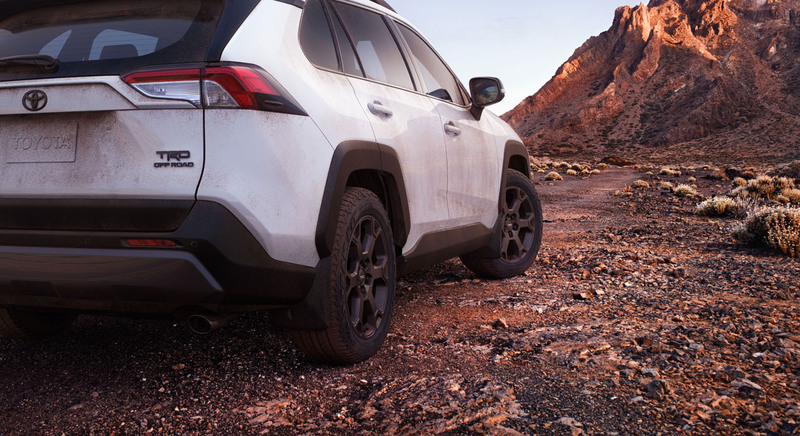 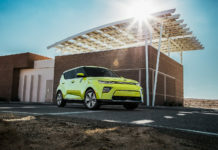 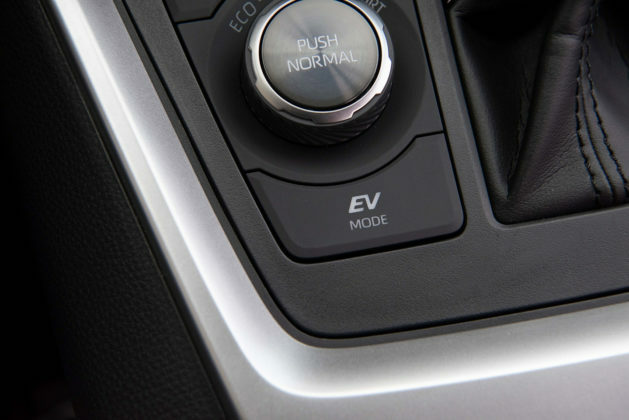 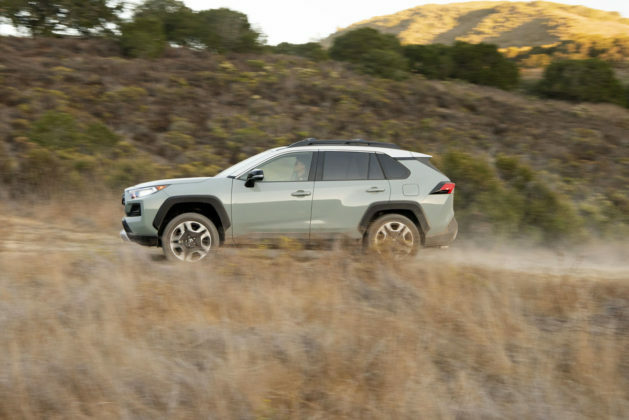 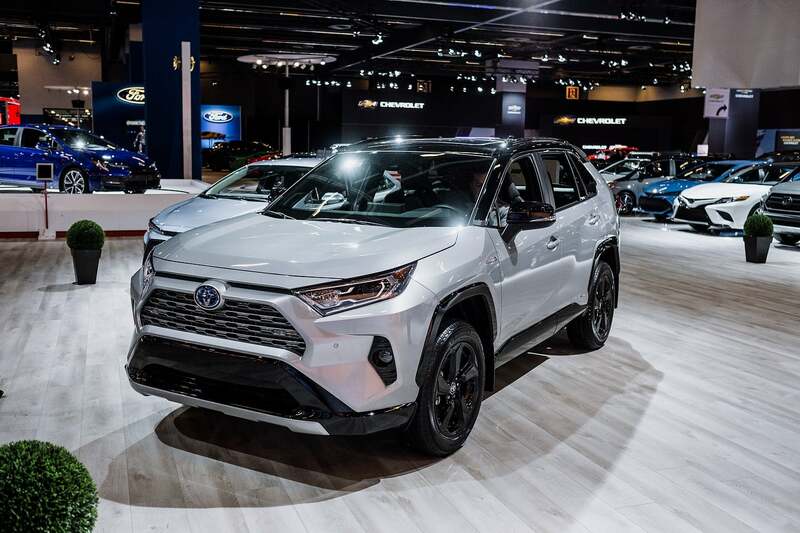 Unlike the Escape, as far as we can tell at the moment, the RAV4 Hybrid provides standard All Wheel Drive with Intelligence (AWD-i) which consists in the electric motor being mounted on the rear axle with a mechanical link between the front and rear wheels. 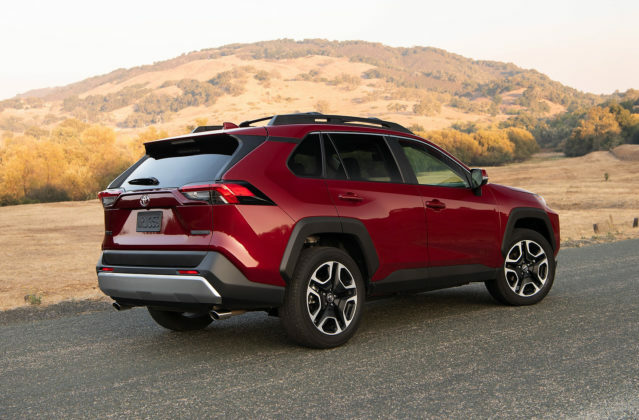 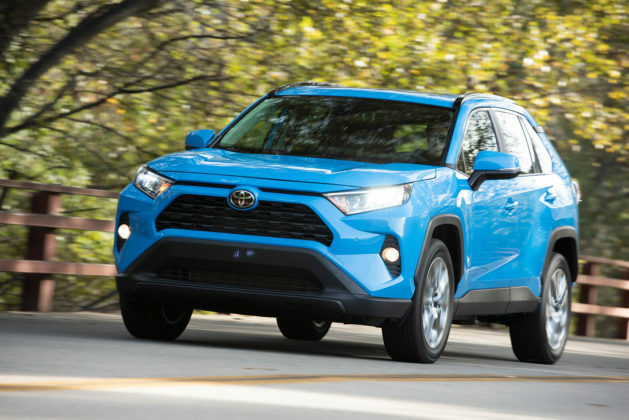 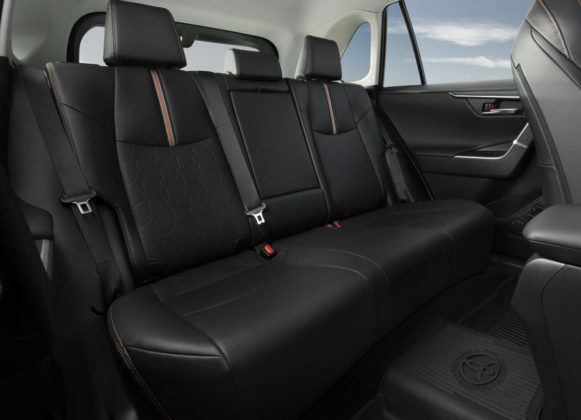 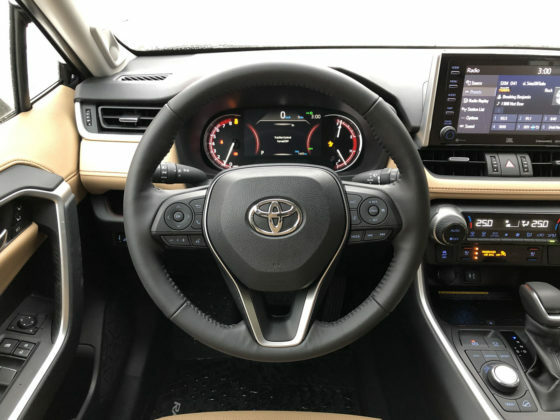 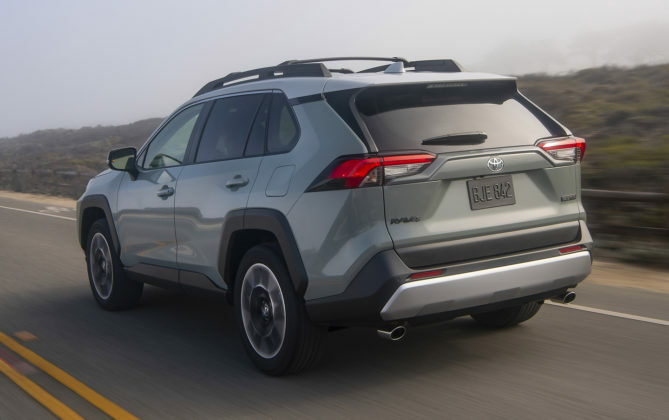 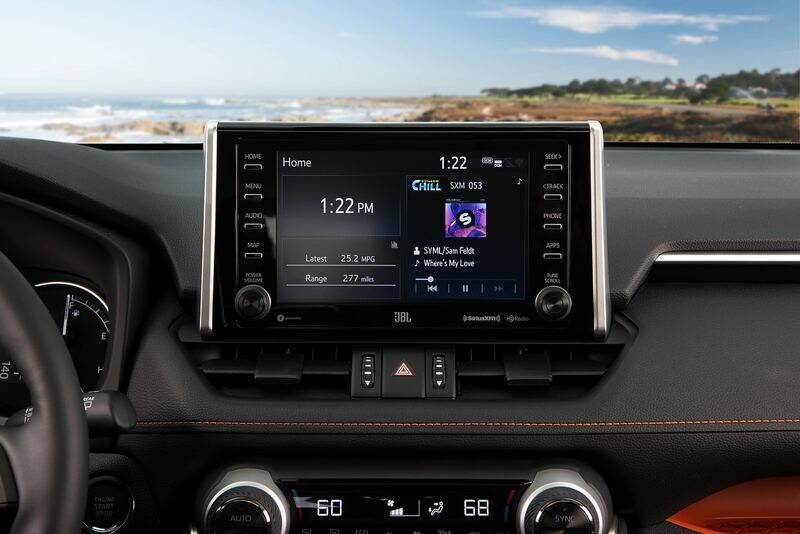 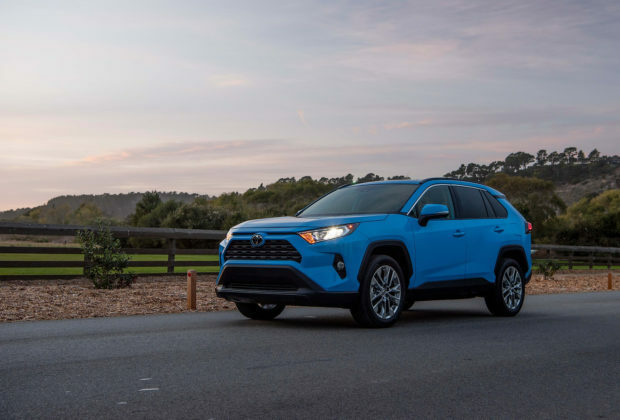 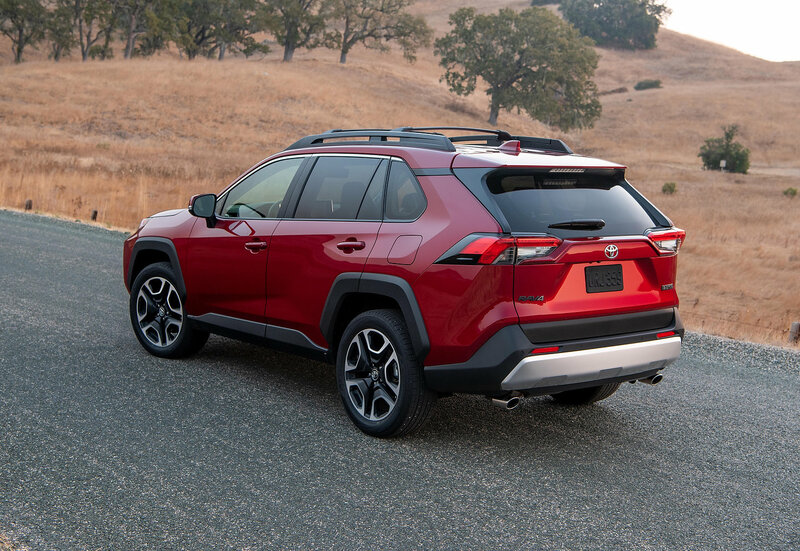 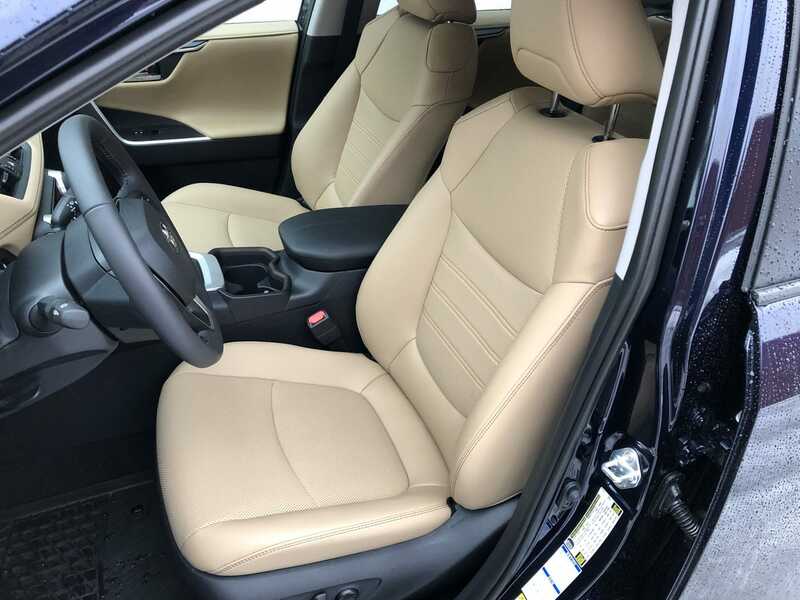 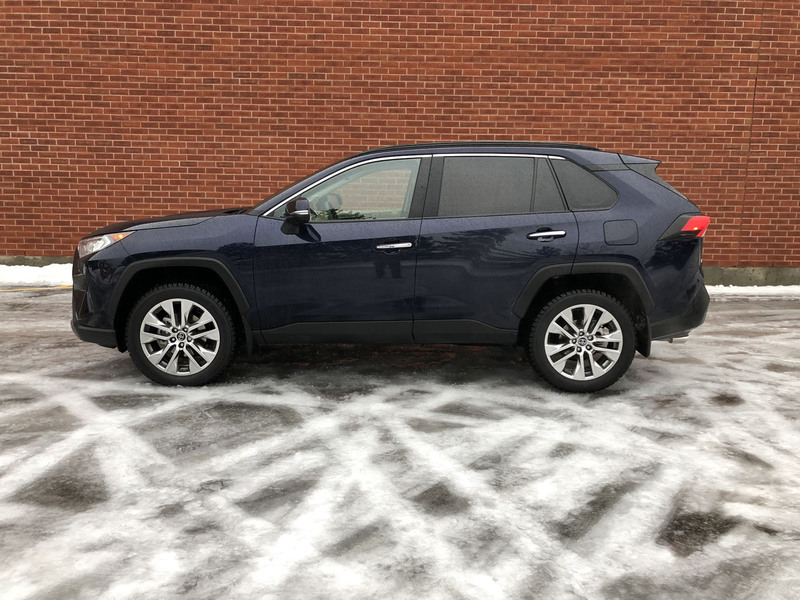 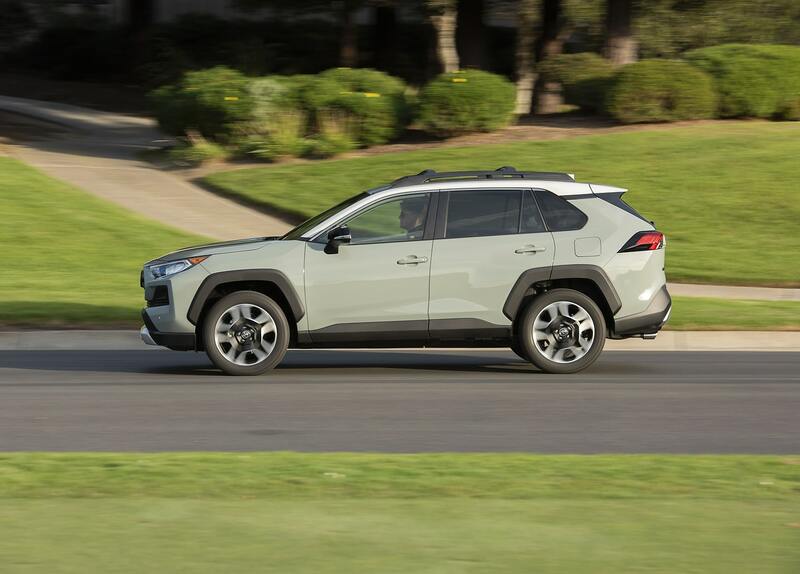 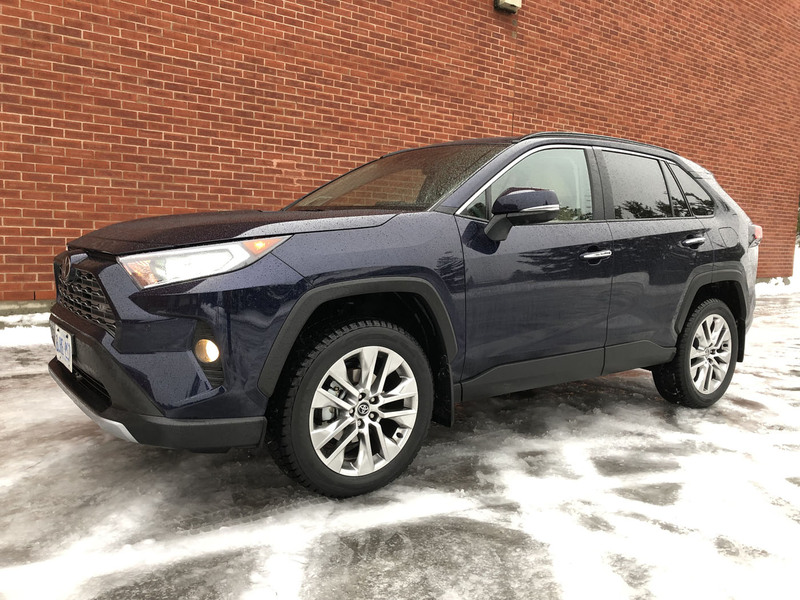 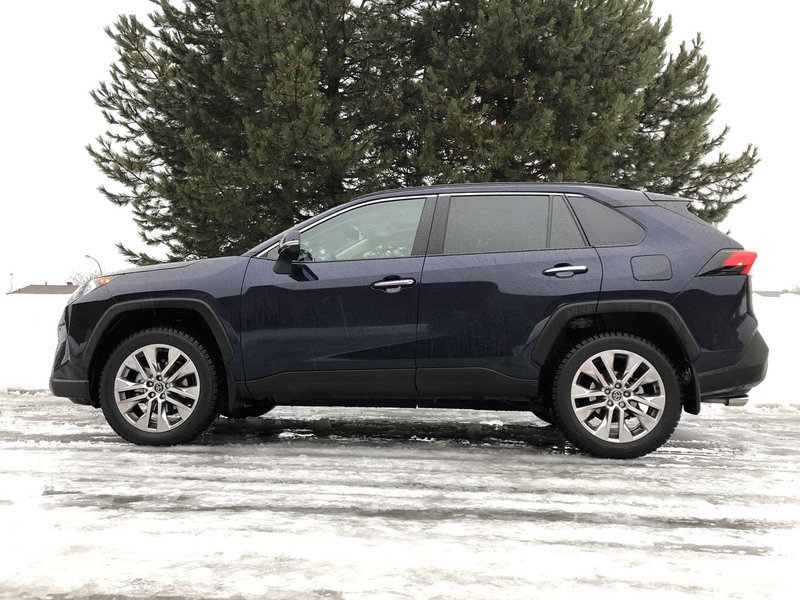 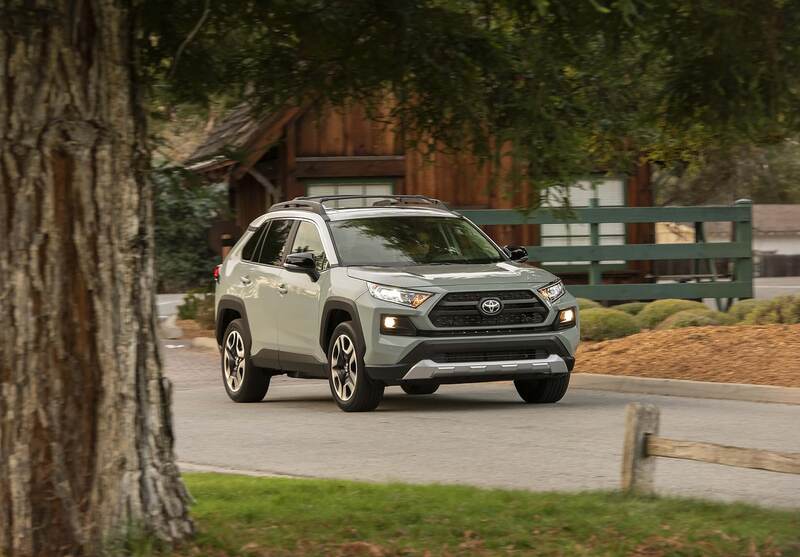 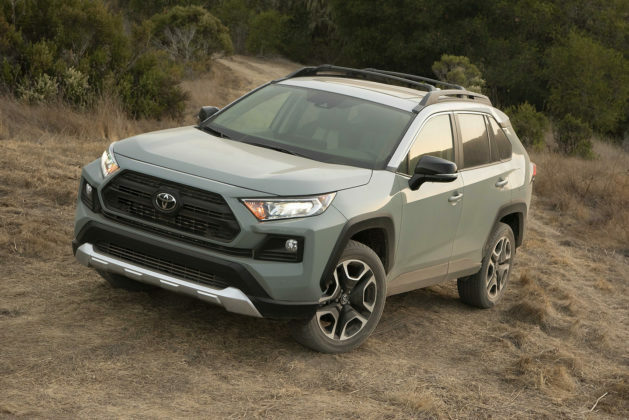 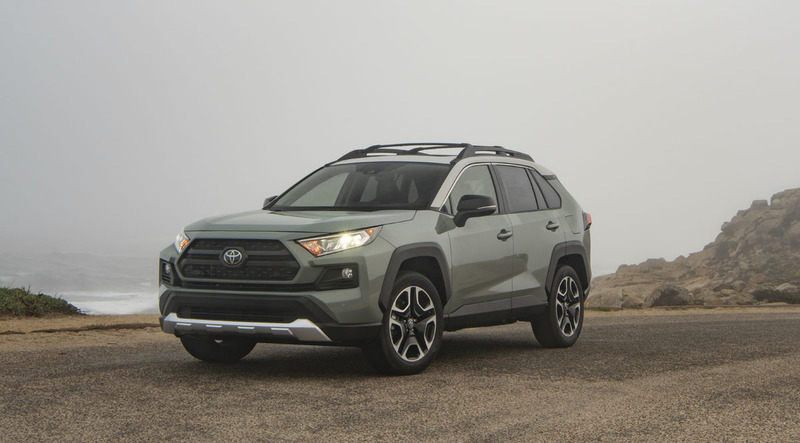 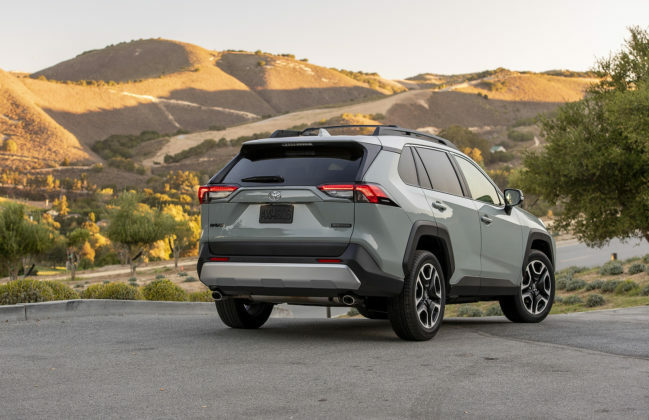 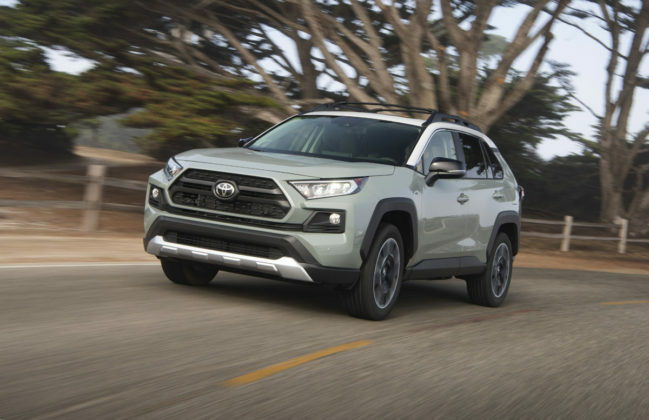 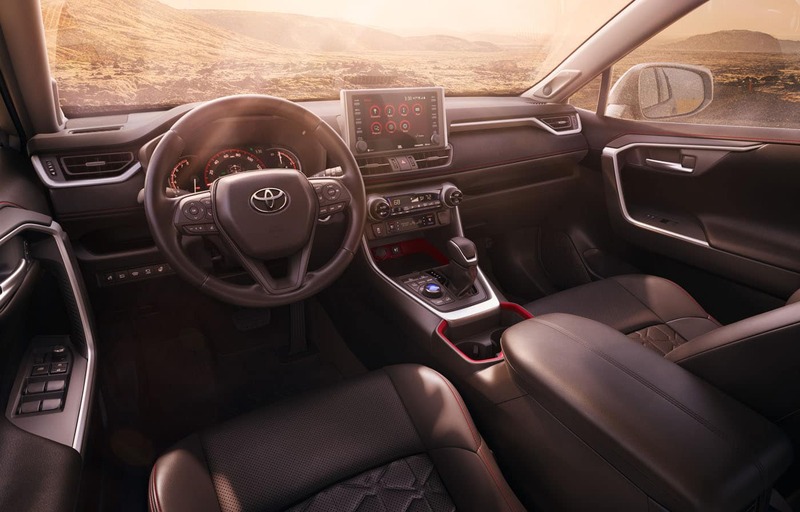 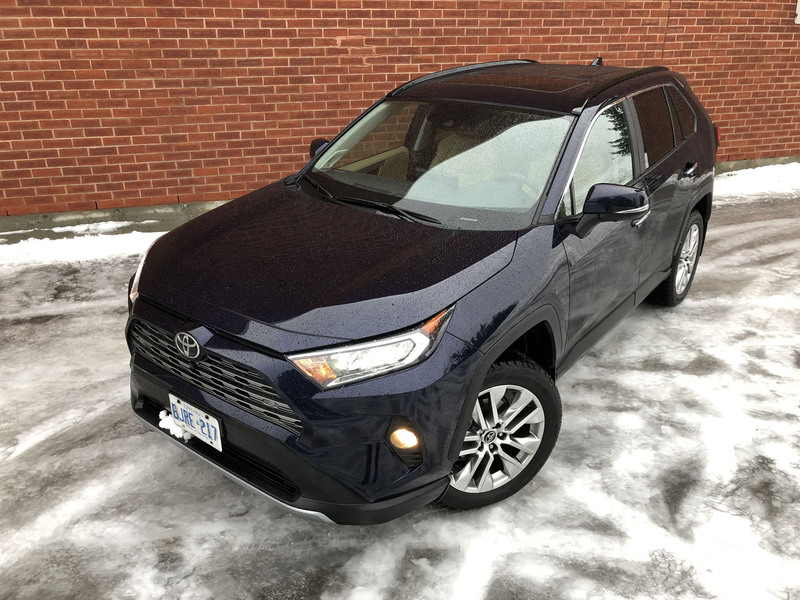 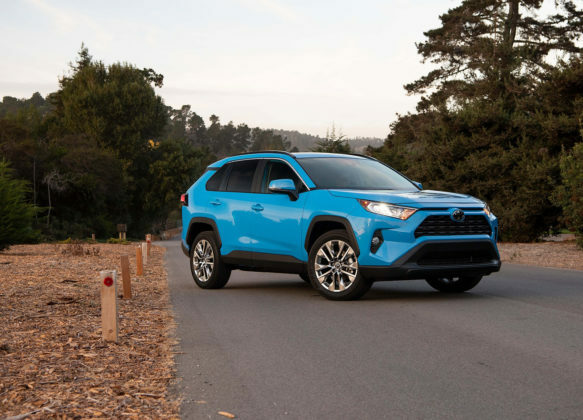 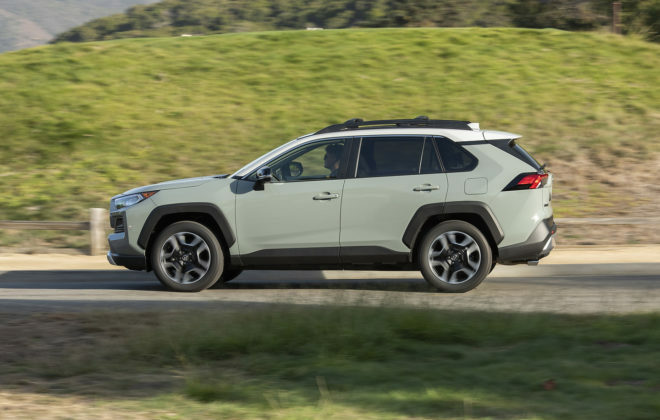 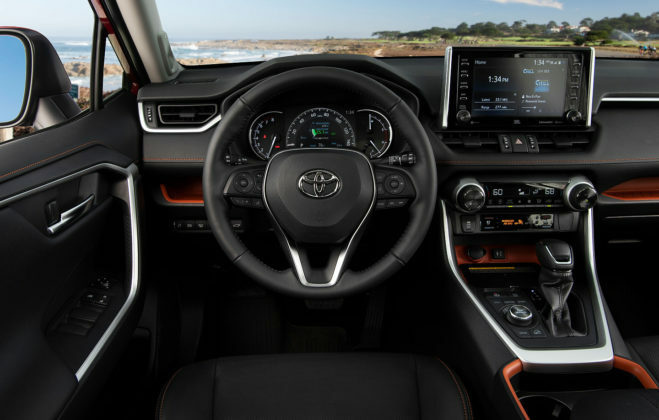 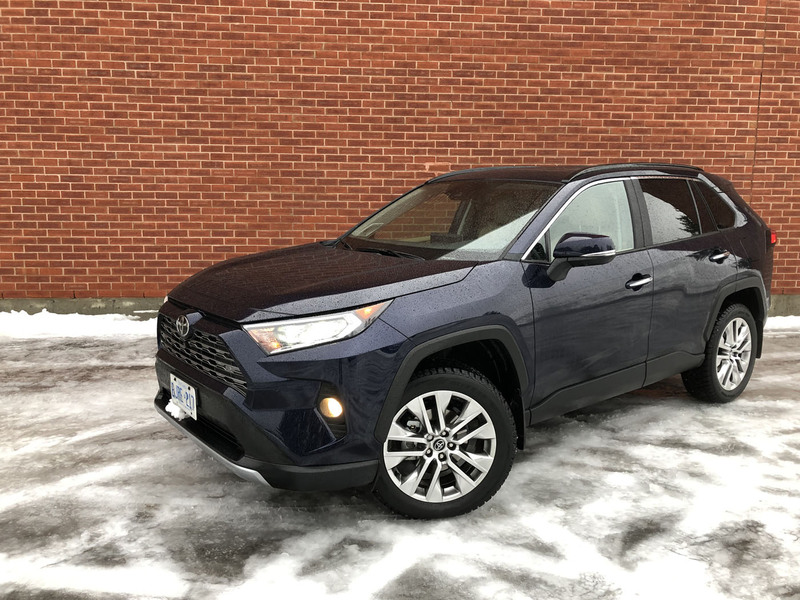 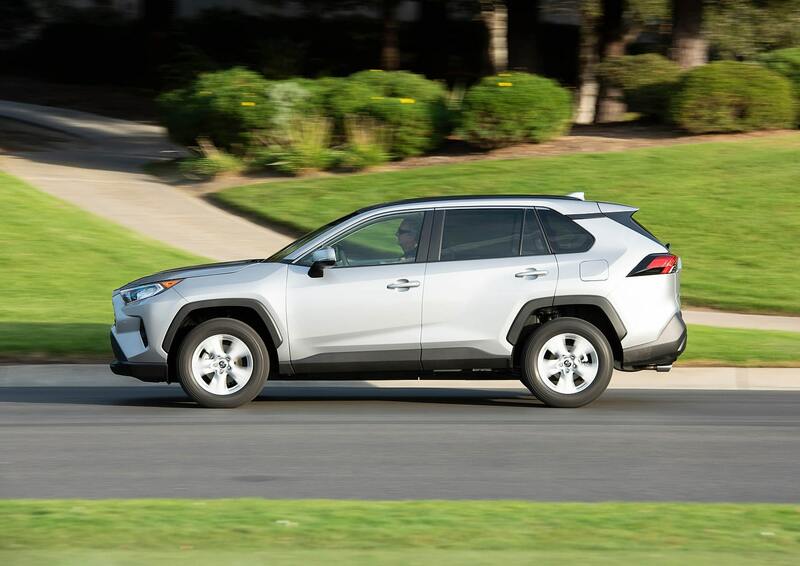 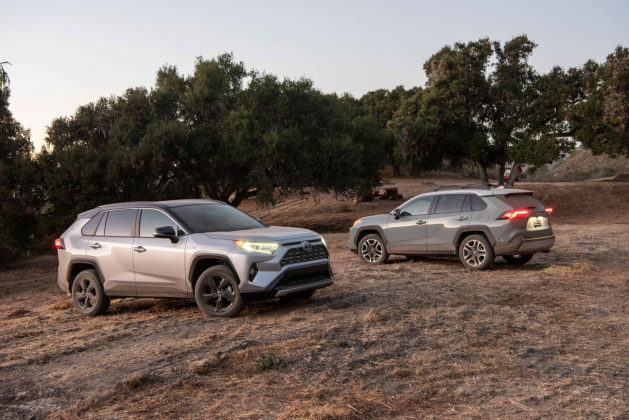 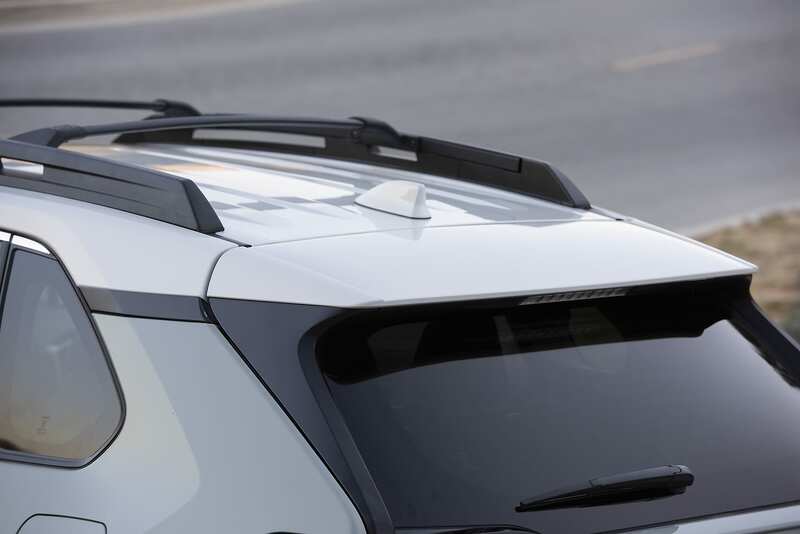 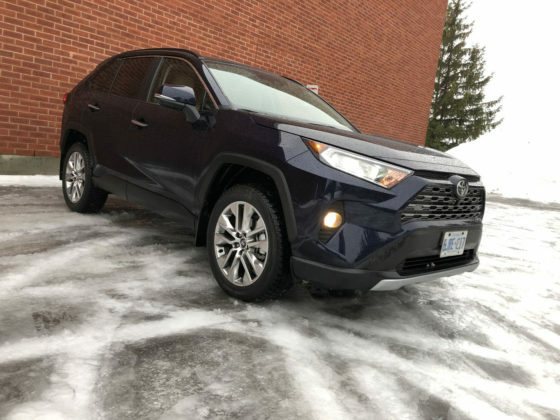 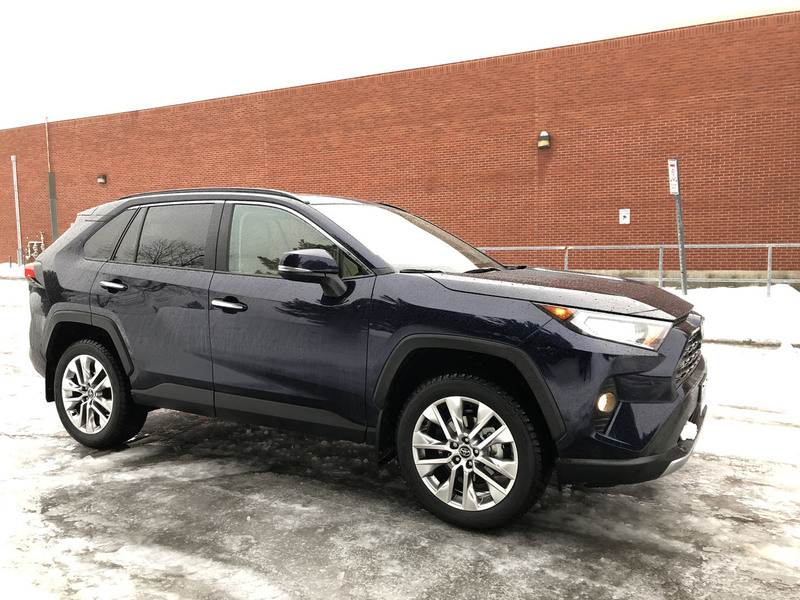 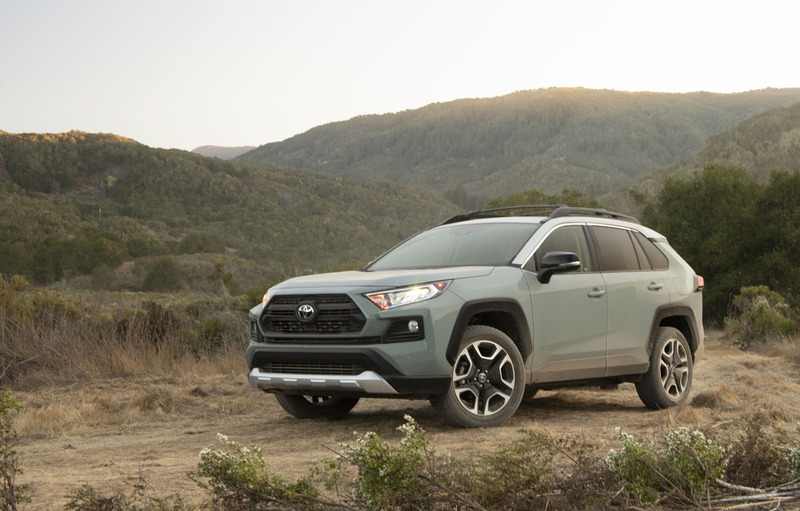 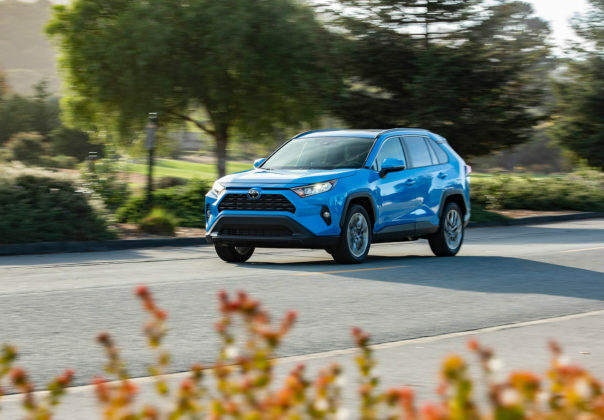 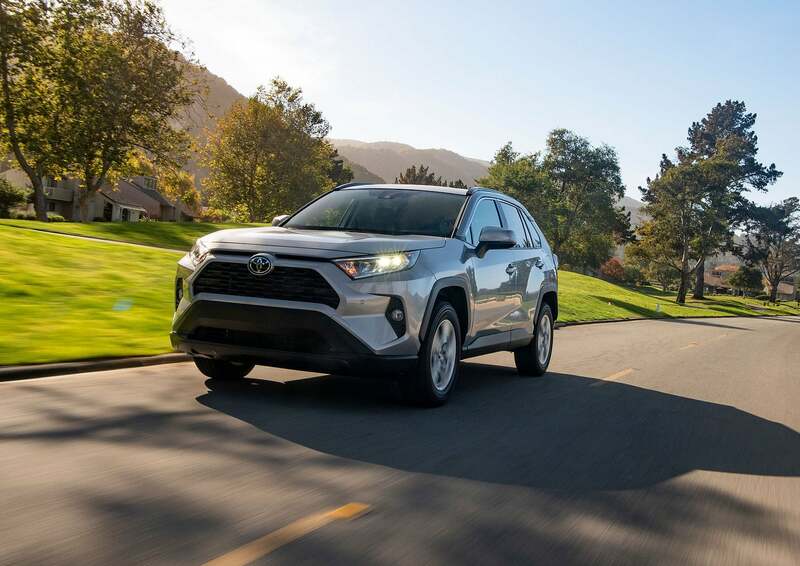 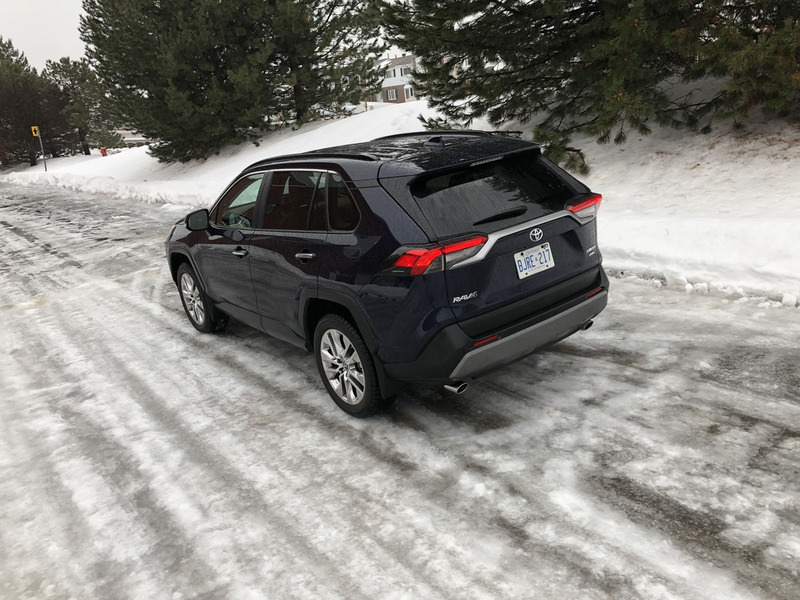 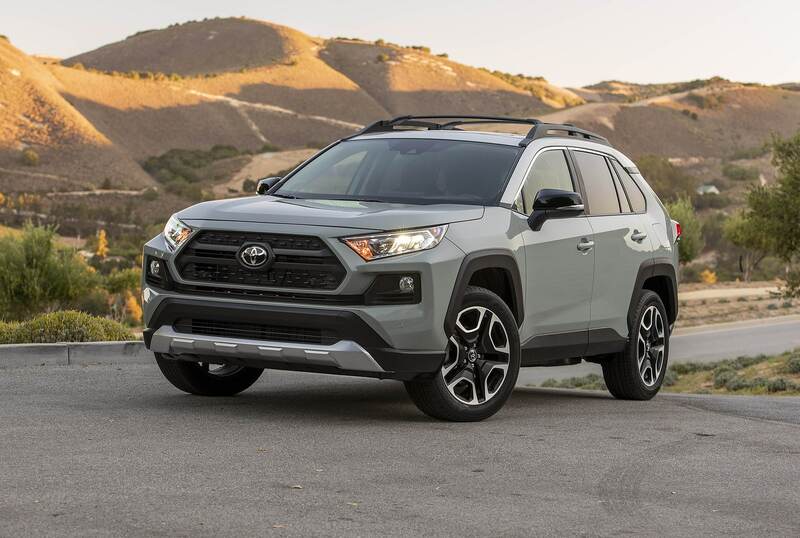 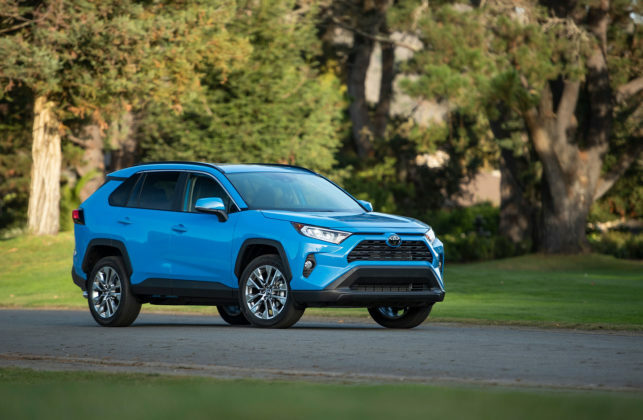 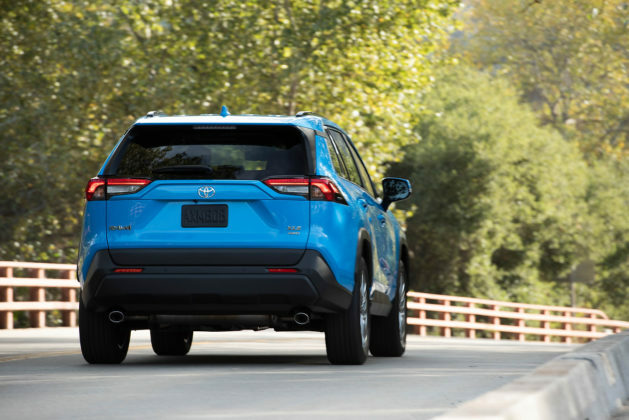 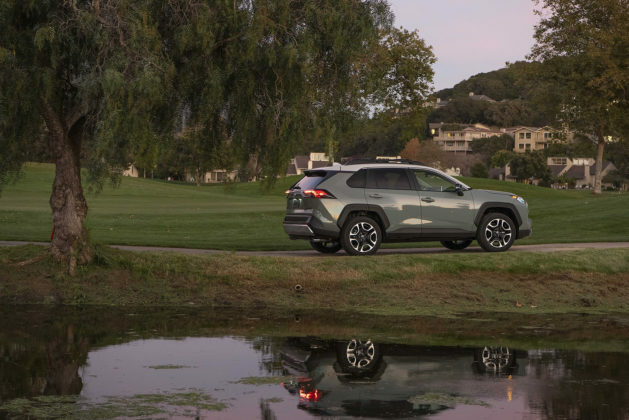 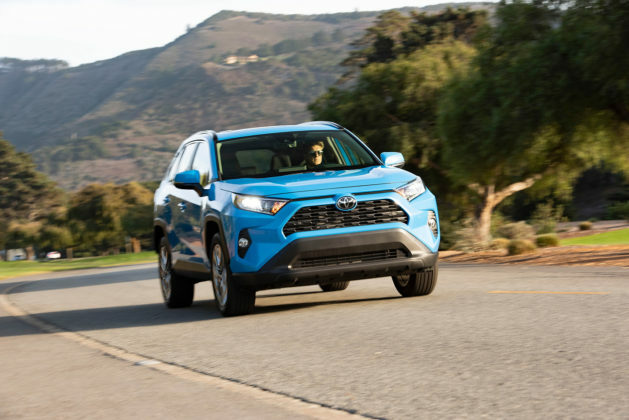 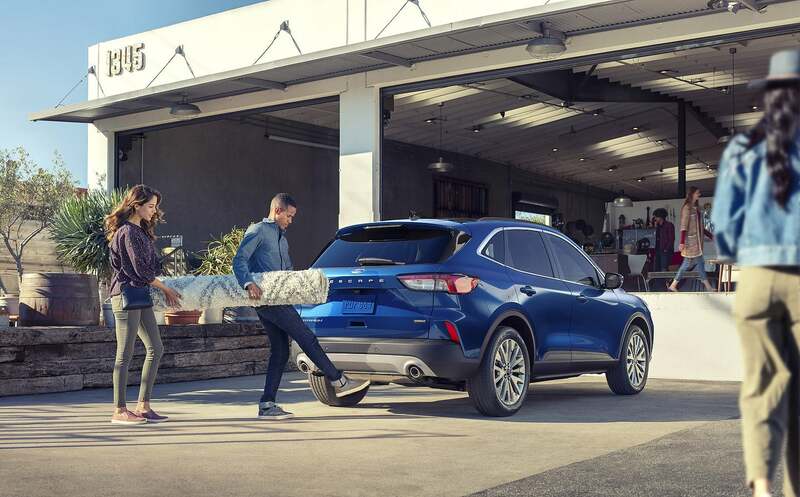 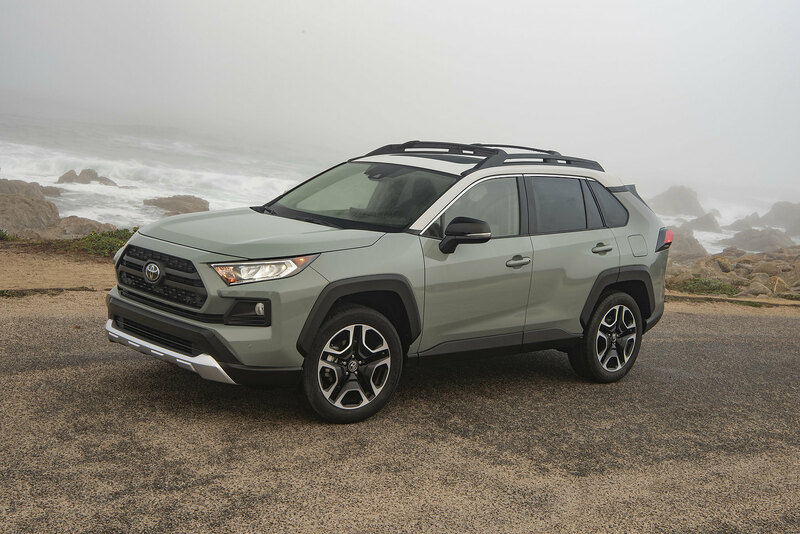 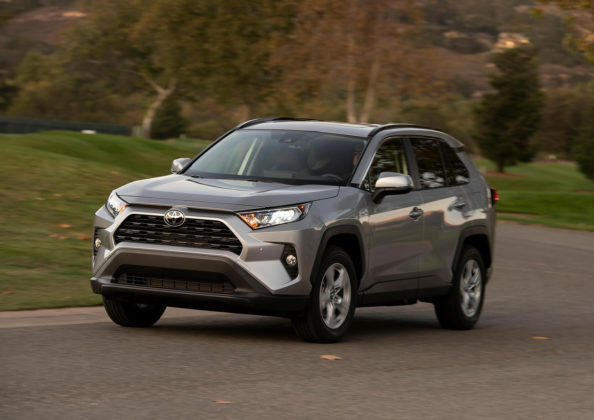 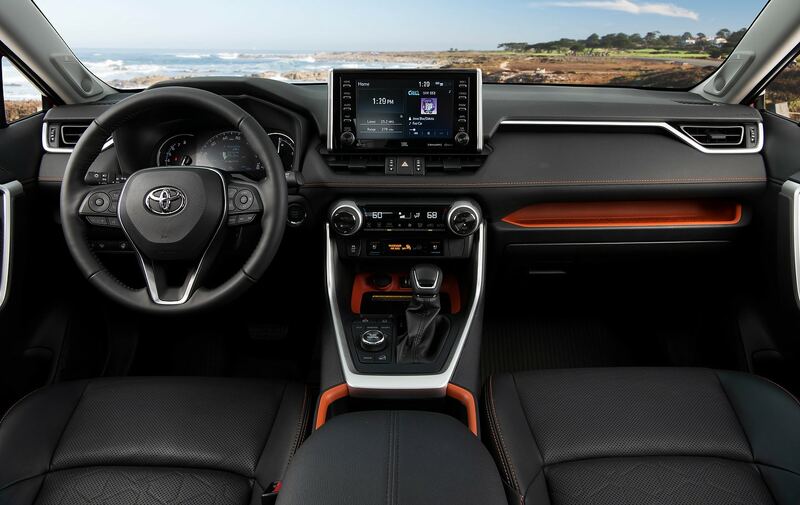 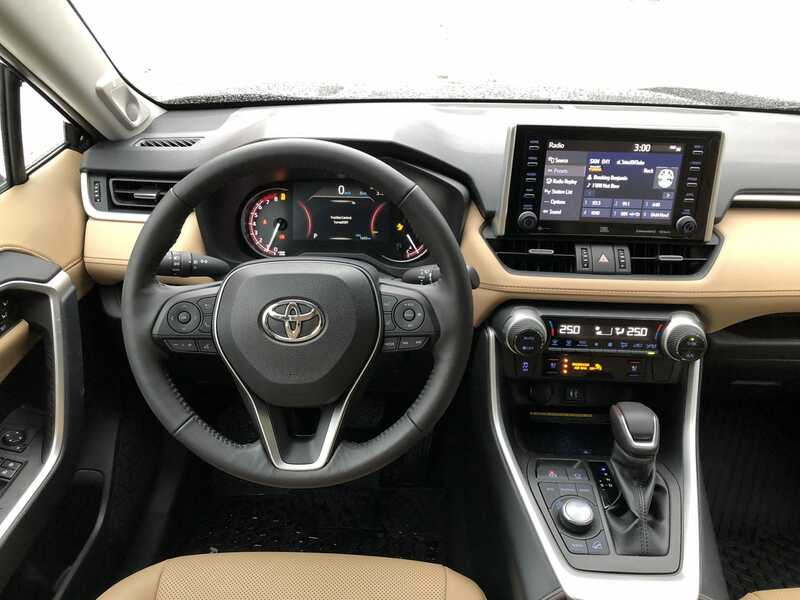 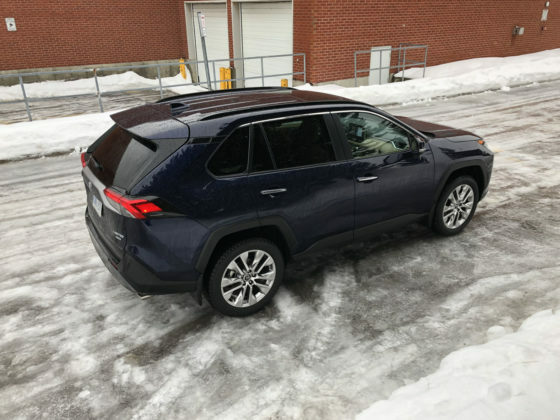 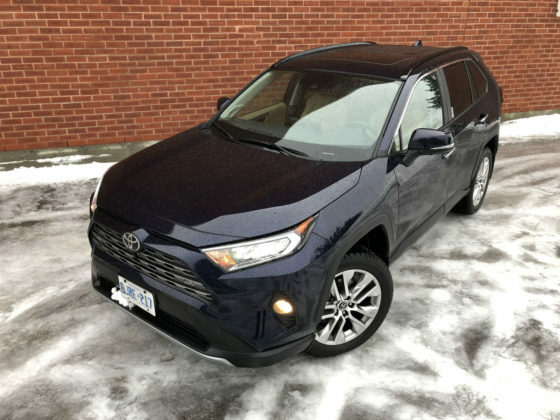 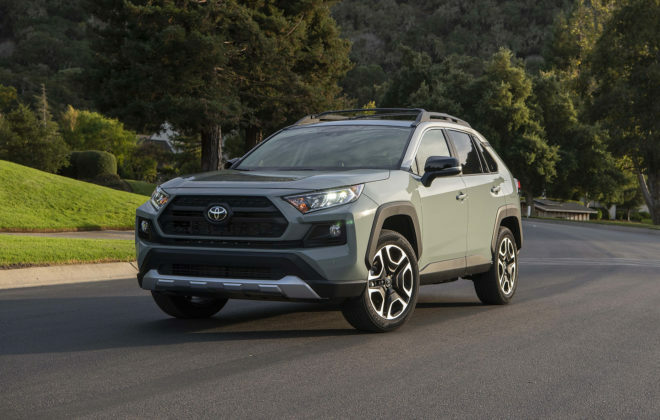 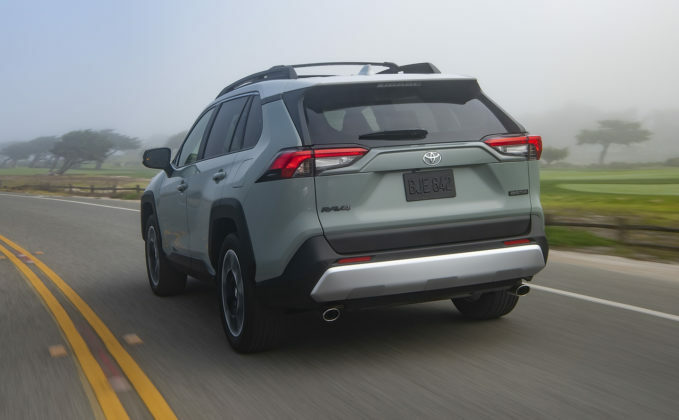 The 2019 Toyota RAV4 is well equipped for the daily grind as of its base $27,990 FWD LE trim. The least expensive AWD is the $30,690 LE which includes Entune 3.0 Audio with 4.2” TFT Multi Information Display, Apple CarPlay, heated front seats and Toyota Safety Sense 2.0 with Blind Spot Monitoring and Rear Cross Traffic Alert. 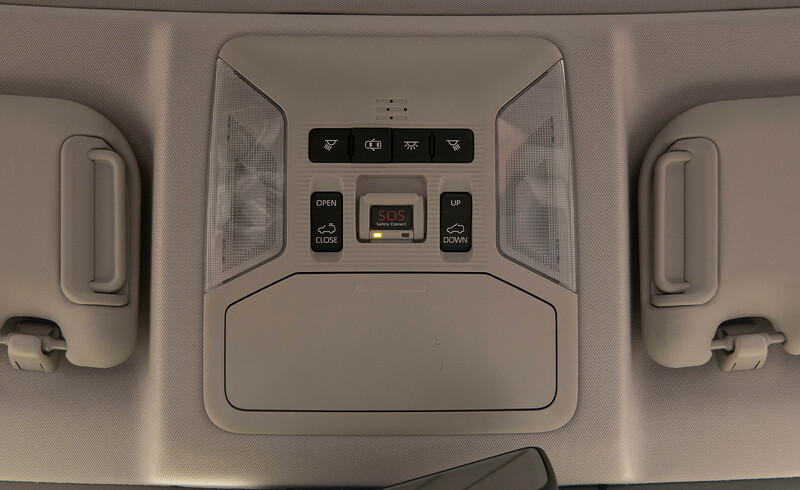 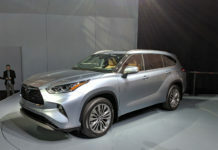 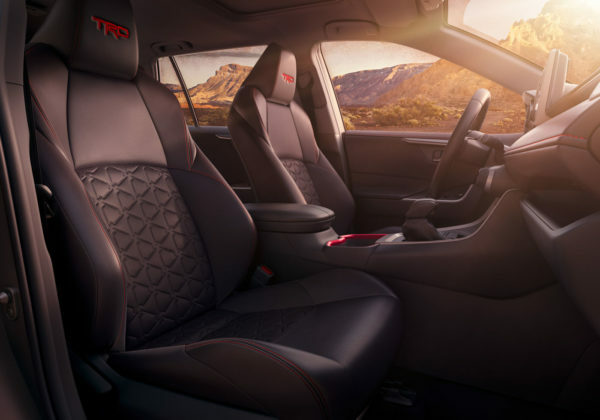 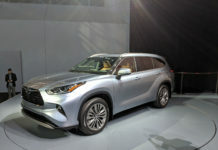 Further up the trim ladder, features such as Dynamic Torque Vectoring All Wheel Drive with Rear Driveline Disconnect, a premium JBL audio system with 9-speaker, 8-inch display and Sirius XM, navigation, Bird’s Eye View monitor, heated and ventilated front seats, heated rear seats and steering wheel and hands free power hatchback become available. 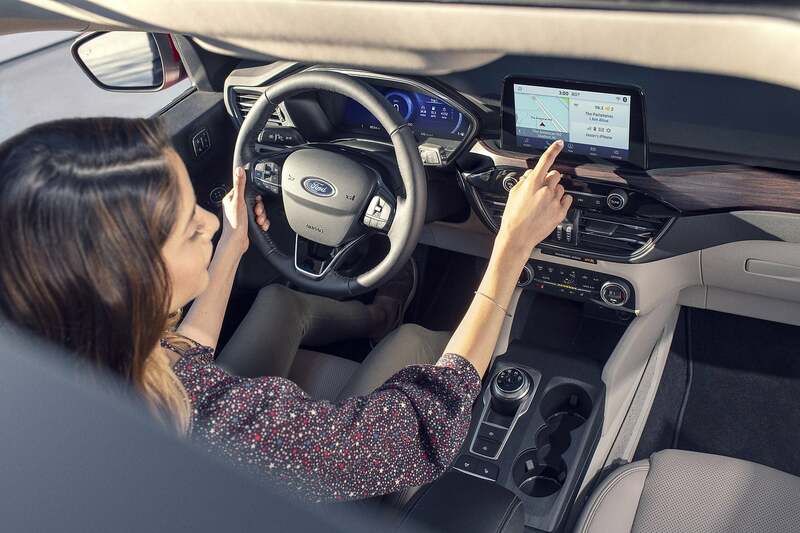 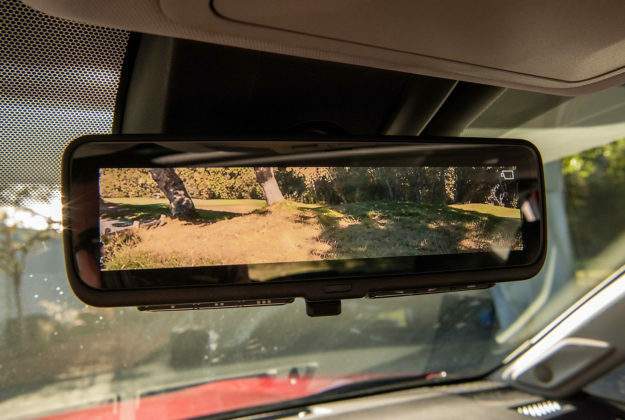 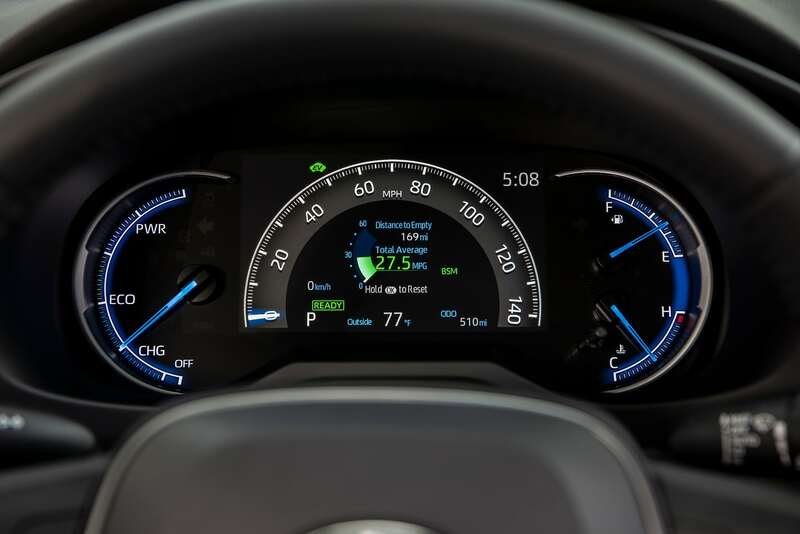 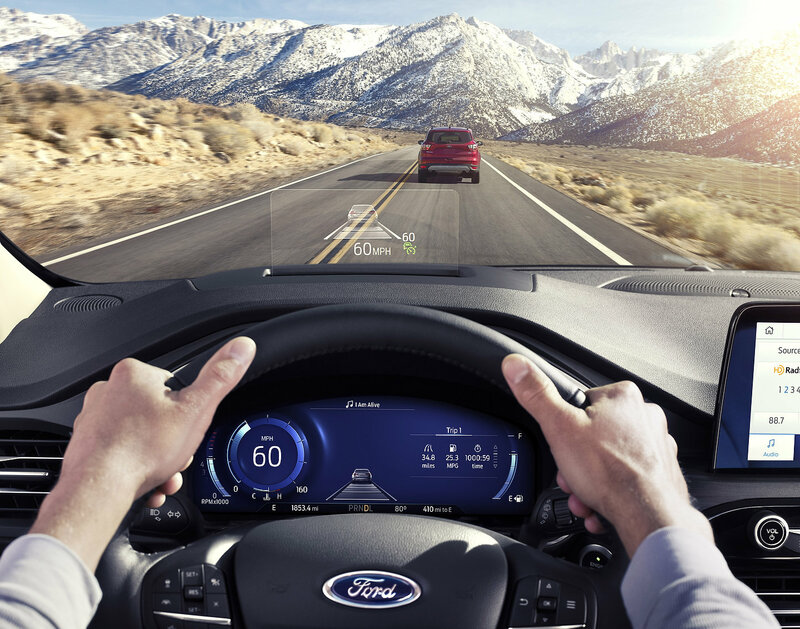 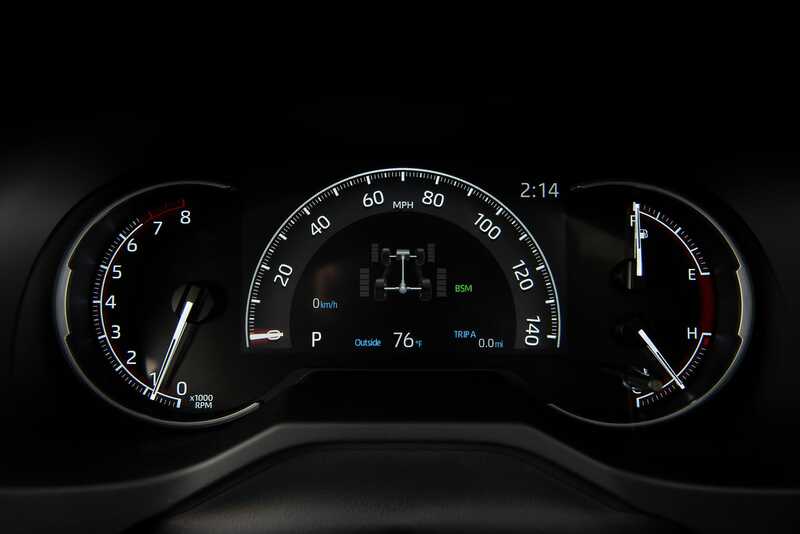 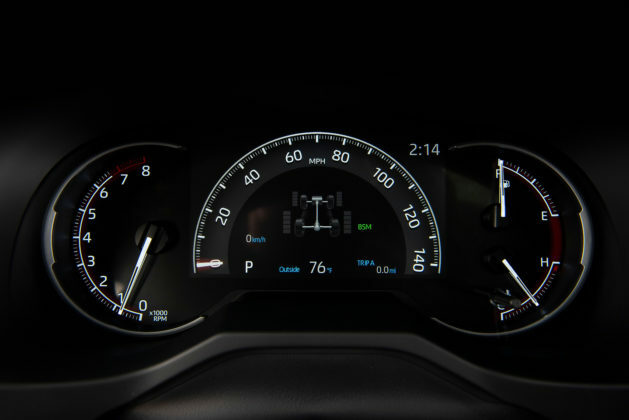 Canadian specifics and trims are not yet known but Ford promises an available 12.3-inch all-digital instrument cluster, heads-up display, active park assist 2.0 and evasive steering assist. 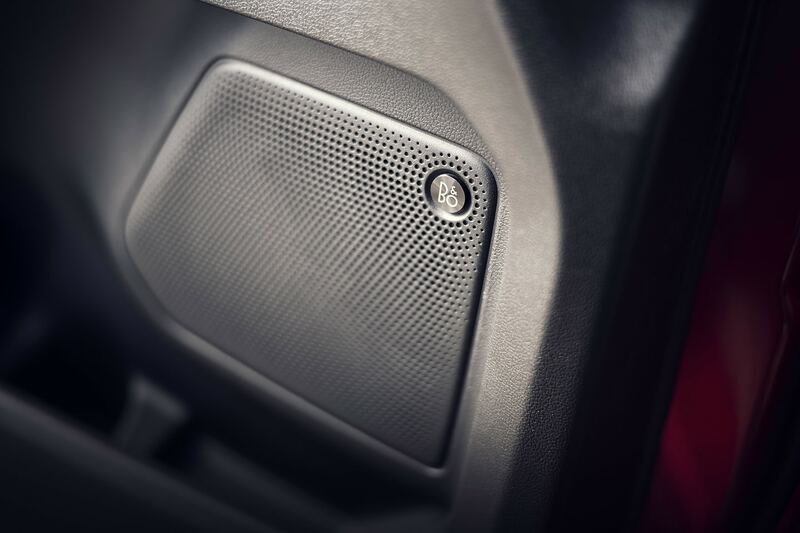 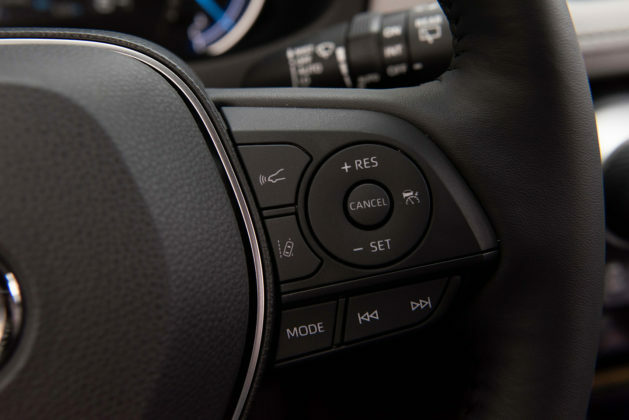 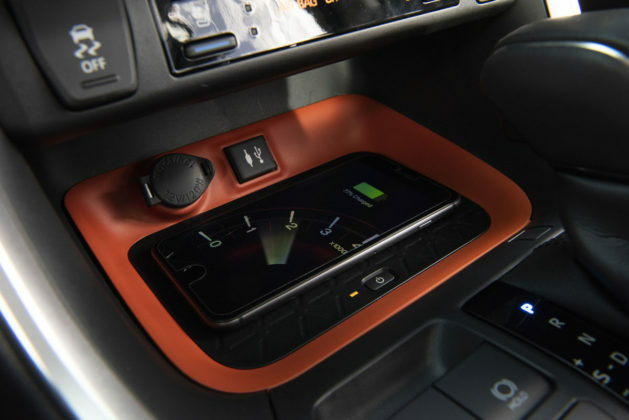 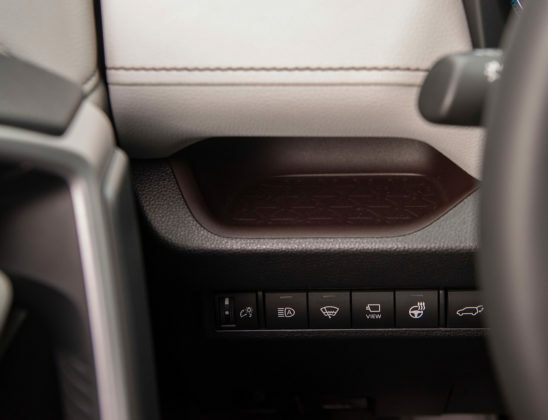 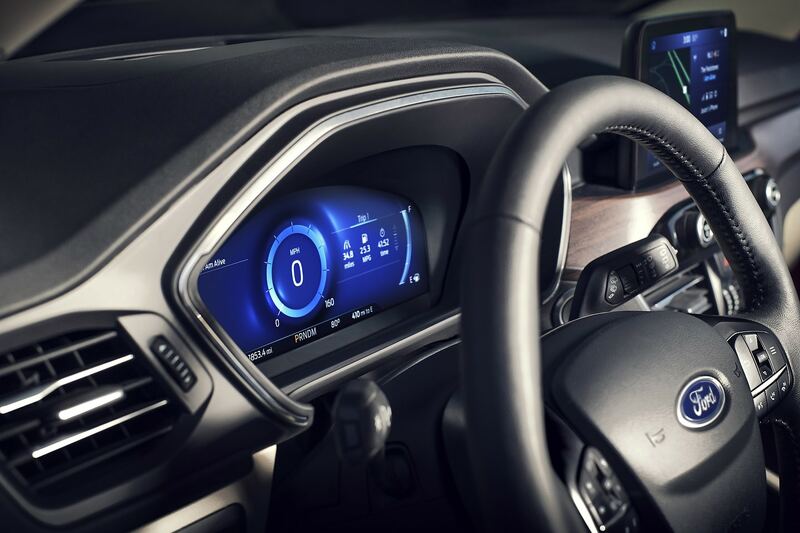 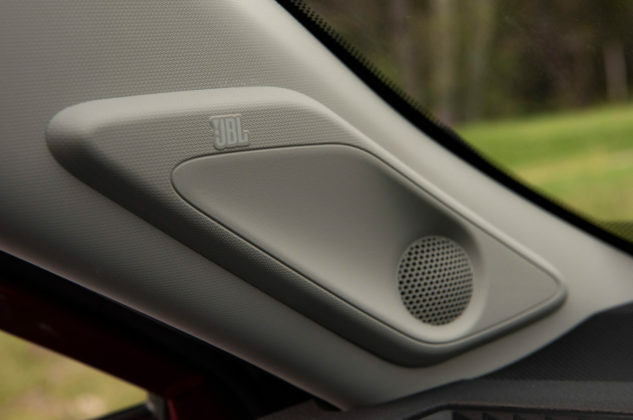 Other features include sliding second-row seats, 4G LTE Wi-Fi, 8-inch display, SYNC 3 with Apple CarPlay, Android Auto, Ford+Alexa and Waze navigation as well as an available 575-watt 10-speaker B&O Sound System by Bang & Olufsen. 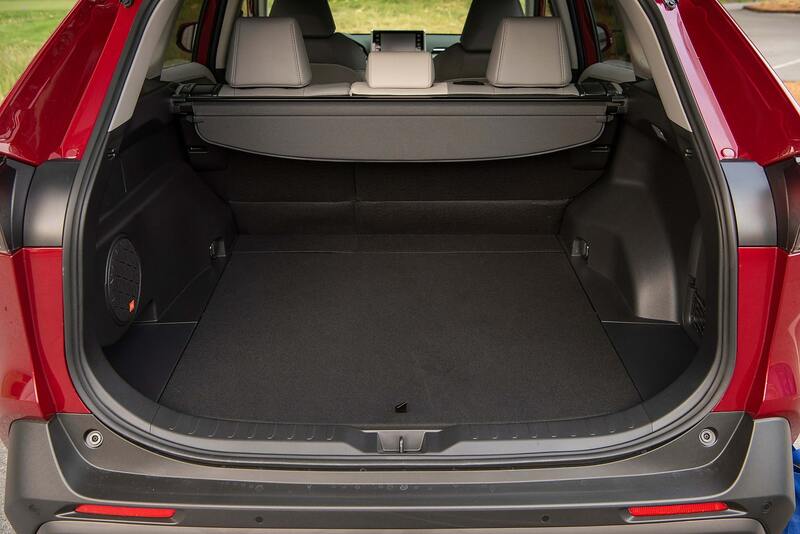 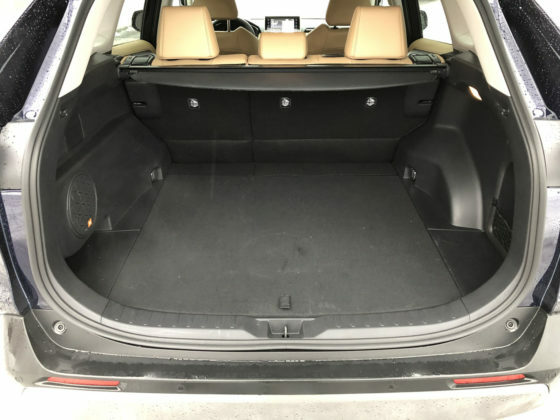 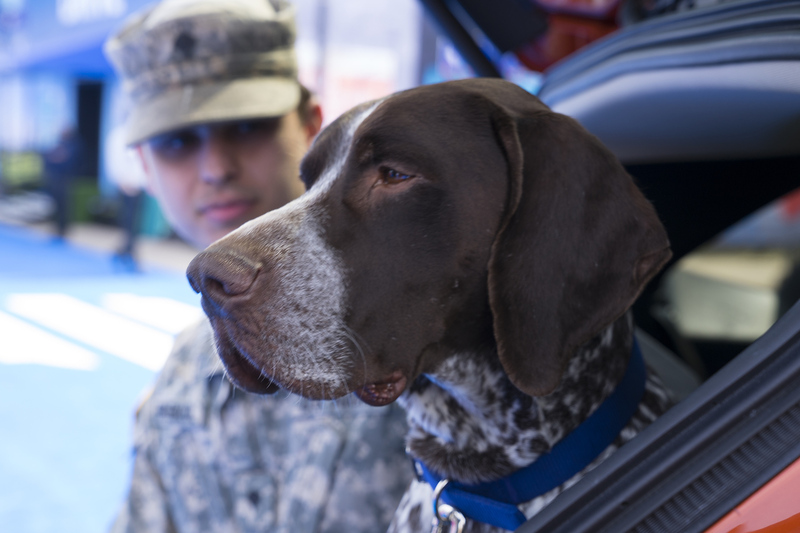 Both vehicles provide between 1,060 -1,065 litres of trunk volume. We’re not quite sure what to make of the new 2020 Ford Escape yet. Styling-wise, we find it strange in a way that Ford would decide to make its Escape look more car-like than ever when most of its competitors are aiming for a more rugged or sophisticated design. 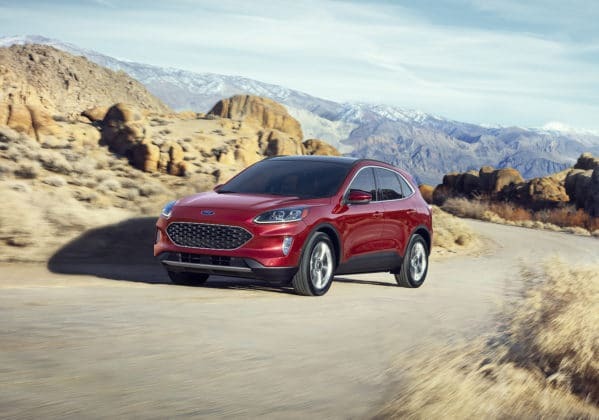 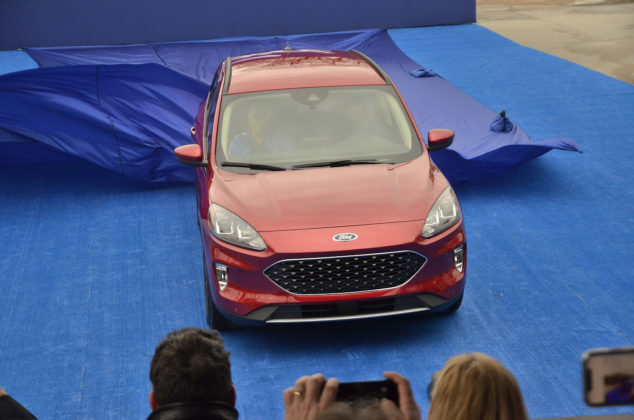 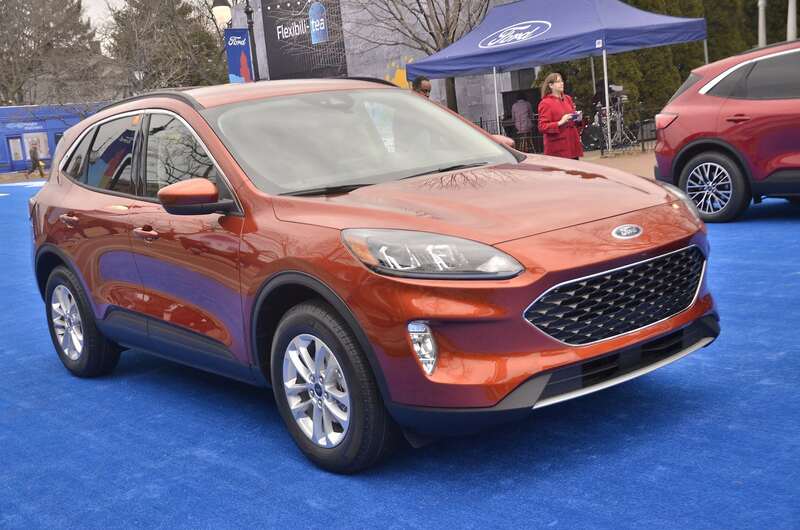 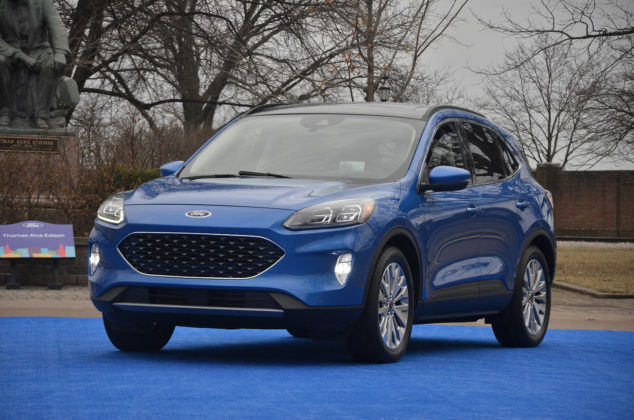 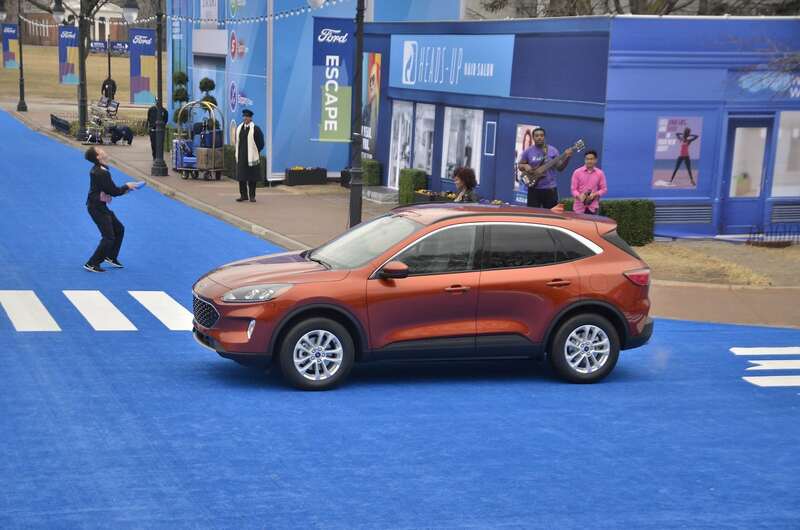 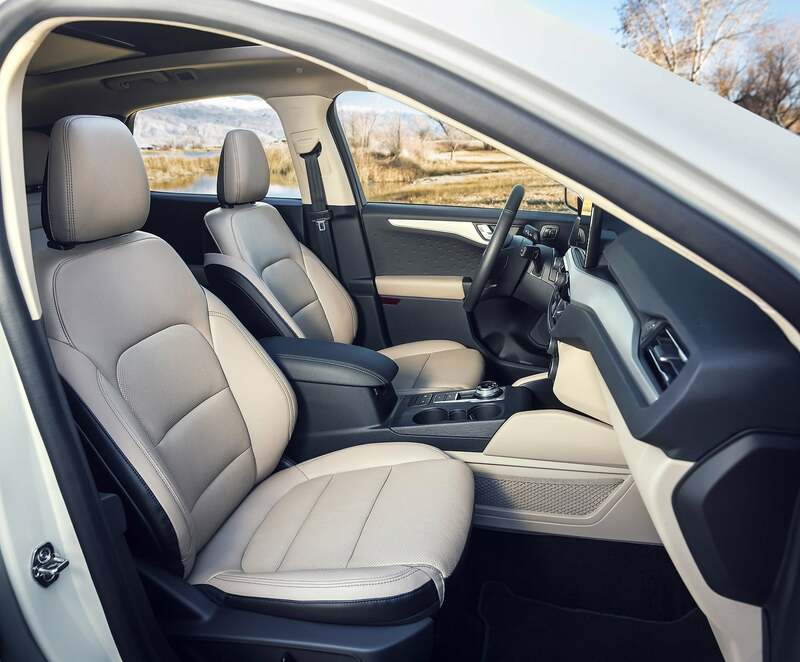 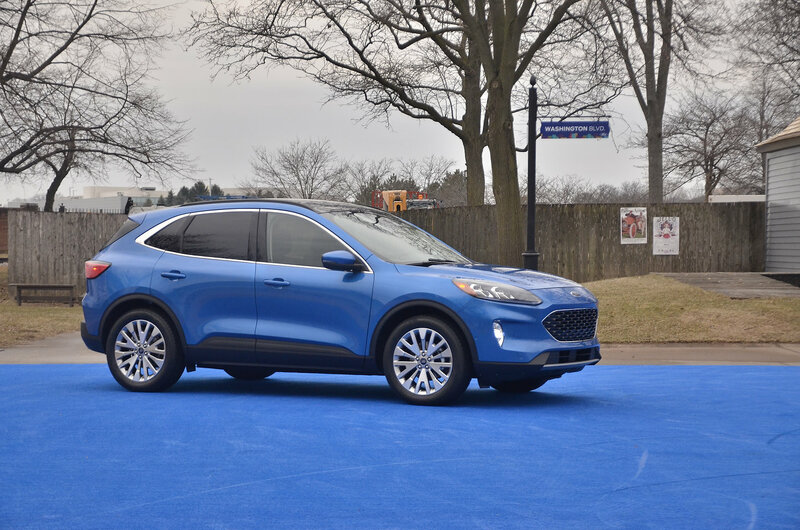 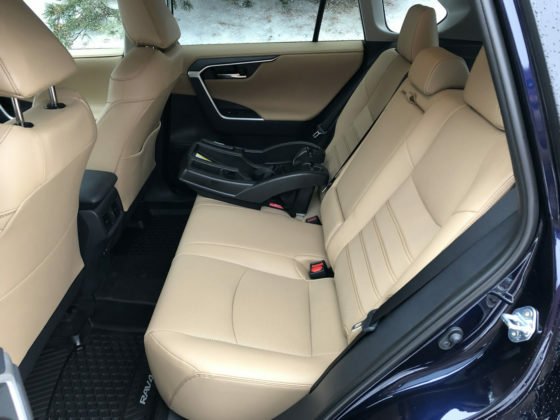 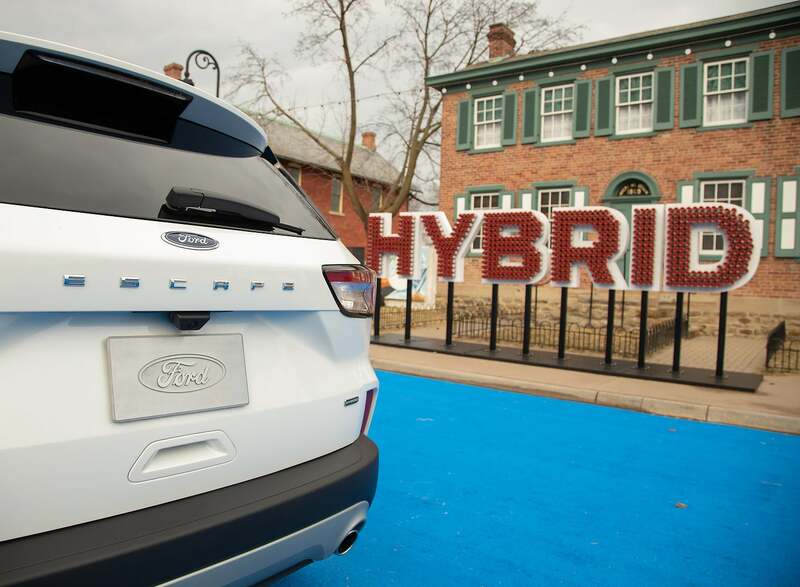 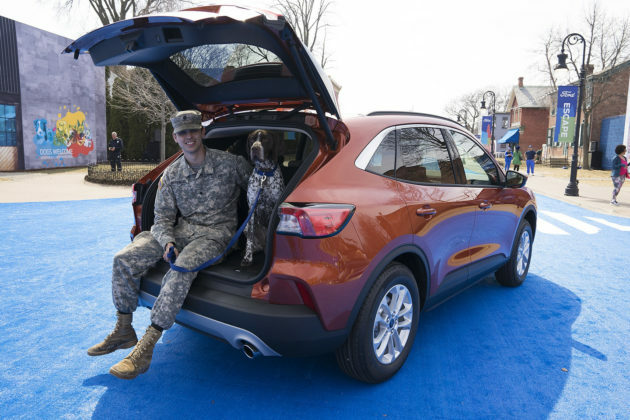 The previous generation Ford Escape, which provides much of its powertrain features to the new 2020 model, suffered reliability issues. 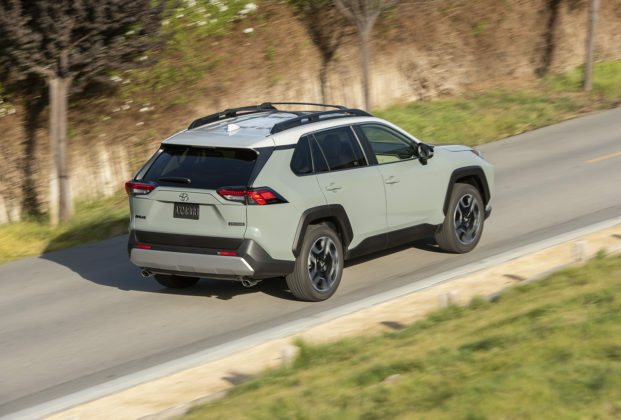 We’re not convinced that this new SUV will be trouble-free in its first year or two of production. 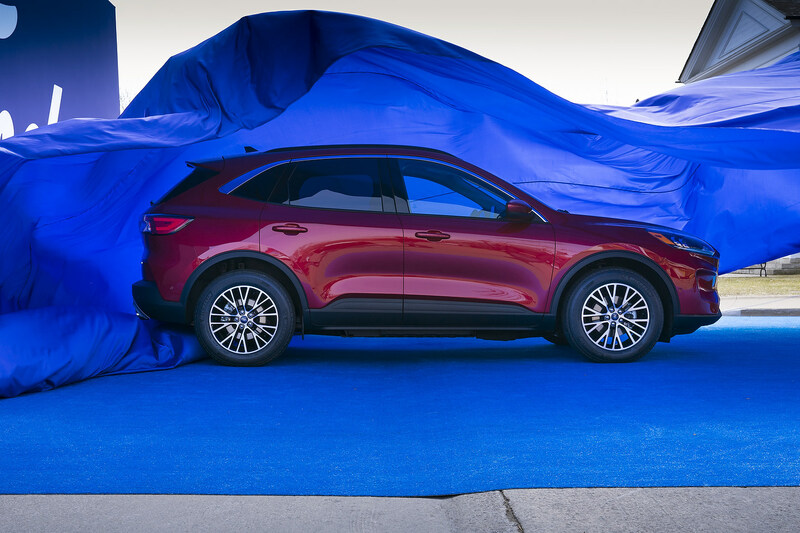 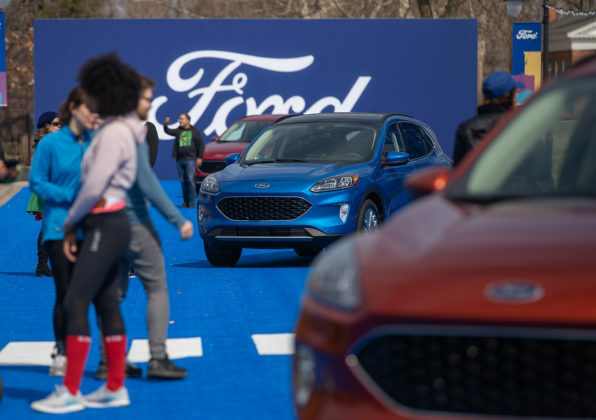 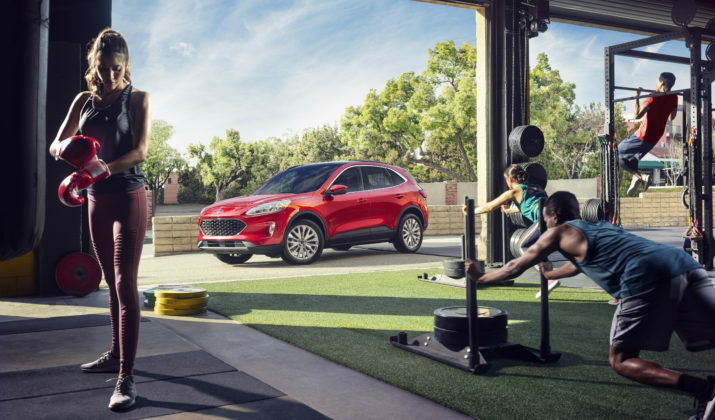 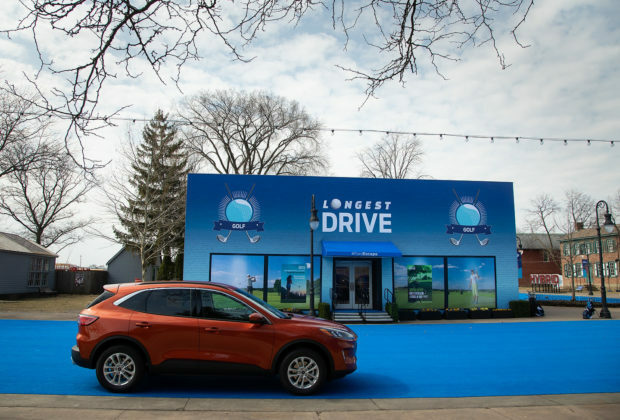 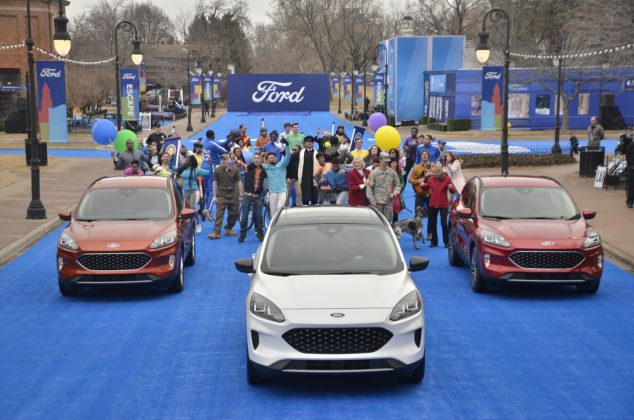 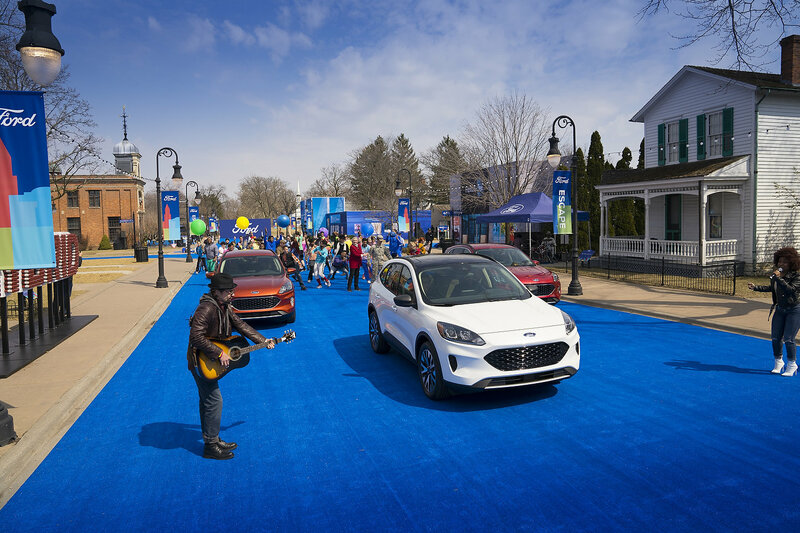 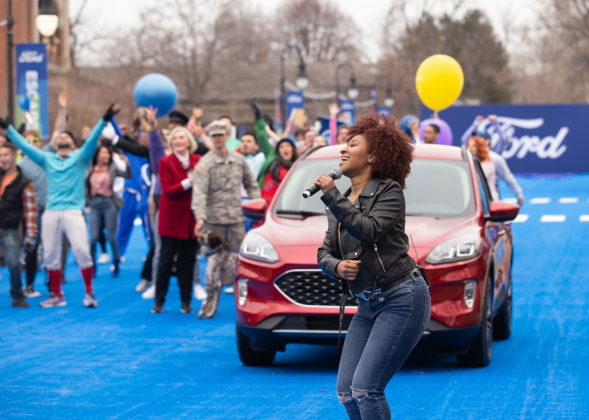 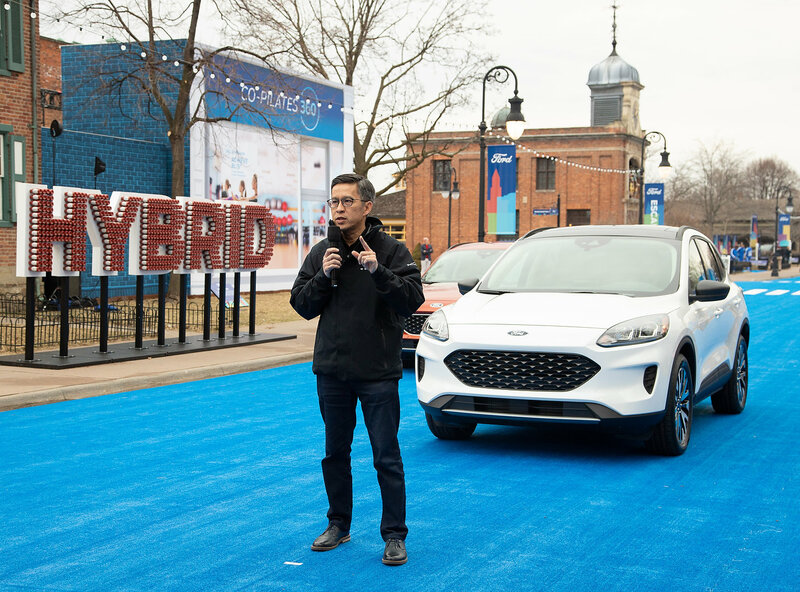 Having said that, Ford needs the new 2020 Escape to be as perfect as possible as it will attempt to lure Fiesta, Focus and Fusion buyers, or more precisely, prevent them from leaving Ford showrooms altogether. The Toyota RAV4 is, although not quite perfect, a safer bet. 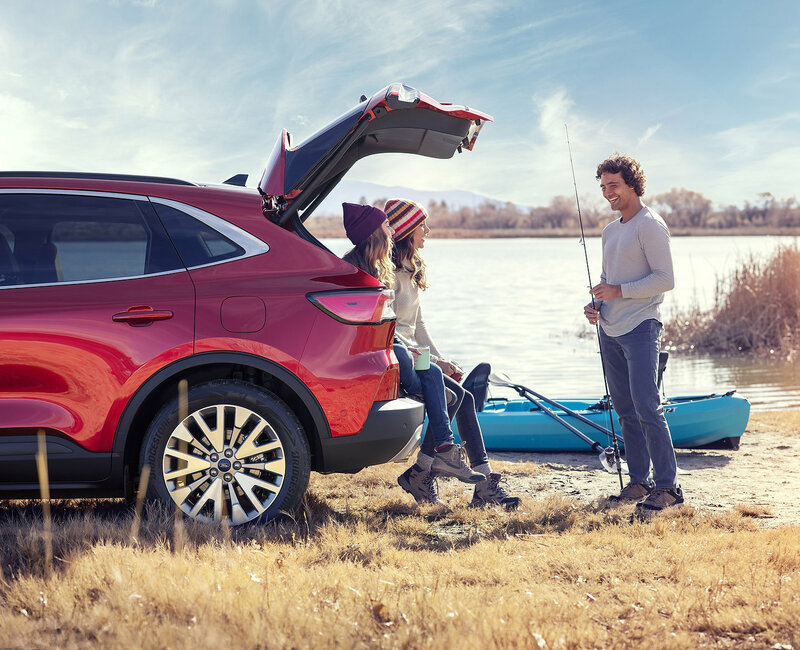 Purchasing one now is a wise choice even though we do not expect to drive the new Escape for many months. 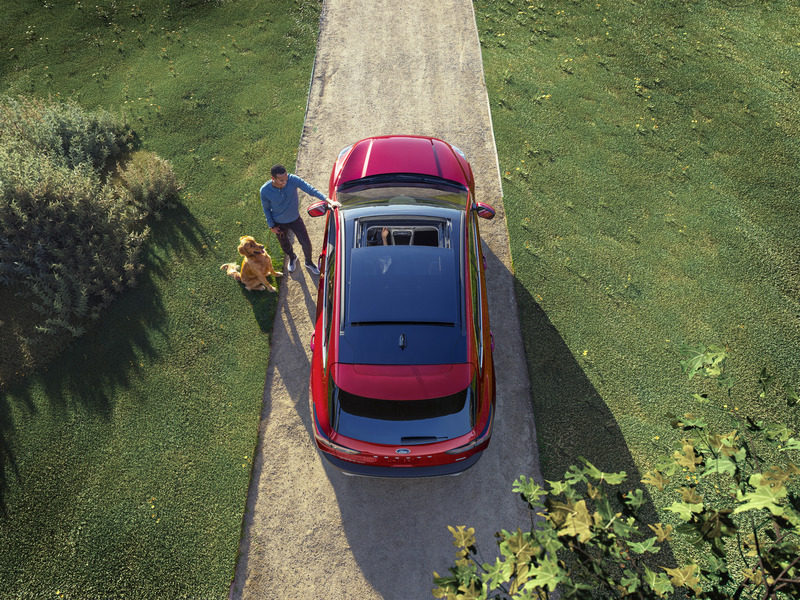 This is the very simple bottom line.